Creating a piece about a famous railroad location such as Salisbury, NC presents a unique challenge. It is not unlike undertaking a new volume about the Civil War or the Kennedy assassination as examples simply because there is such a wealth of general and documented information about the topic. The secret in such an instance is approaching the subject from a different angle perhaps in a means that has not yet been fully explored. 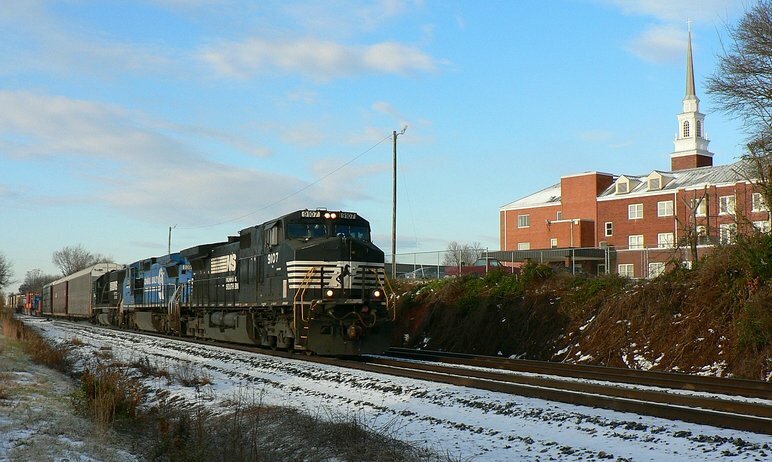 Within the borders of North Carolina extending outward into a regional sphere, the railroad environment at Salisbury is well known both operationally and from a pictorial standpoint. Legions of railfans know the territory, the trains that operate, and the history of the region to varying degrees depending on age and depth of interest. 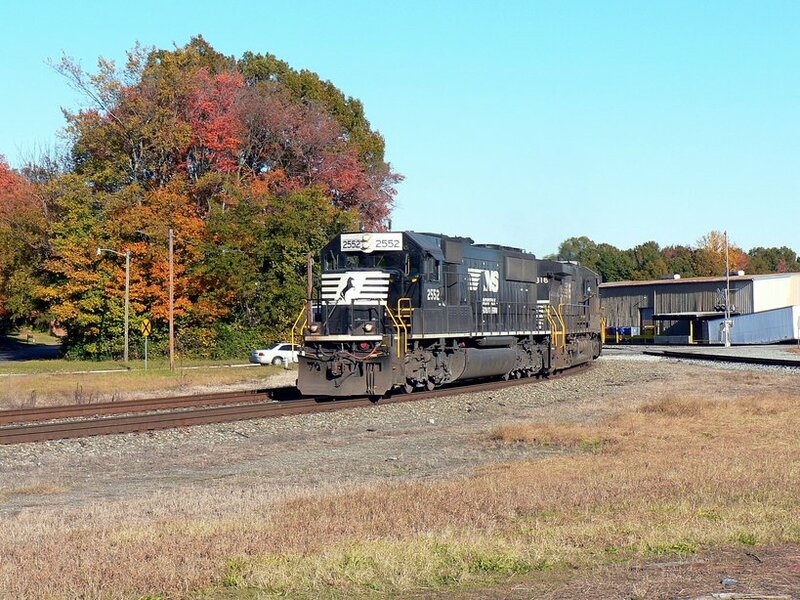 It is at the epicenter of the Norfolk Southern presence in the state and one that is in a continual process of transformation as the railroad converts to a 21st century corridor. Literally thousands of photographs and videos exist of the Salisbury area and especially from the new century. 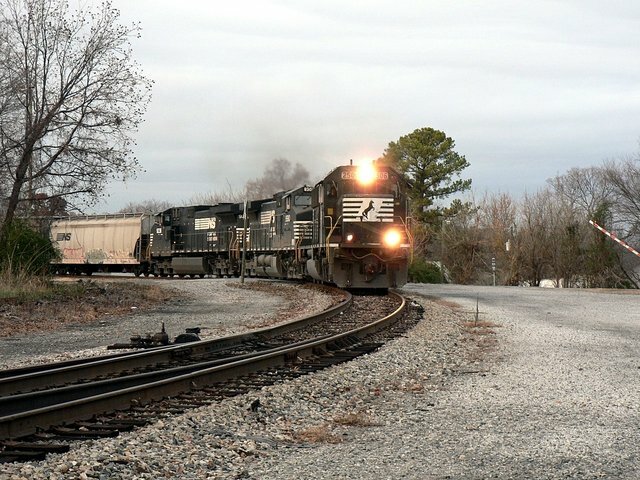 Newer generations of rail enthusiasts armed with digital cameras and camcorders saturate the area recording literally every train that passes through town. Older generations also frequent or “hang out” within the sector watching trains and perhaps contrasting the scene as it is today with times gone by. On the latter theme is the premise for this piece ---deciphering what once existed in the scenes gazed upon by the eyes of today. The premise of this page is to record the present day in context to yesteryear. Where possible, images of shippers long vanished from the scene are inserted as a comparison in addition to differences in trackage. There are instances of these old buildings still in existence transformed from the original purpose or perhaps vacant. Obviously covering a time span of nearly a century, there are others that were relegated to memory years ago. Additional shippers and sidings were constructed during the interim from the date of the maps to the present day. These, too, will be included where possible. This page will be formatted examining specific areas of the old Salisbury city limits as it existed during the 1920s. 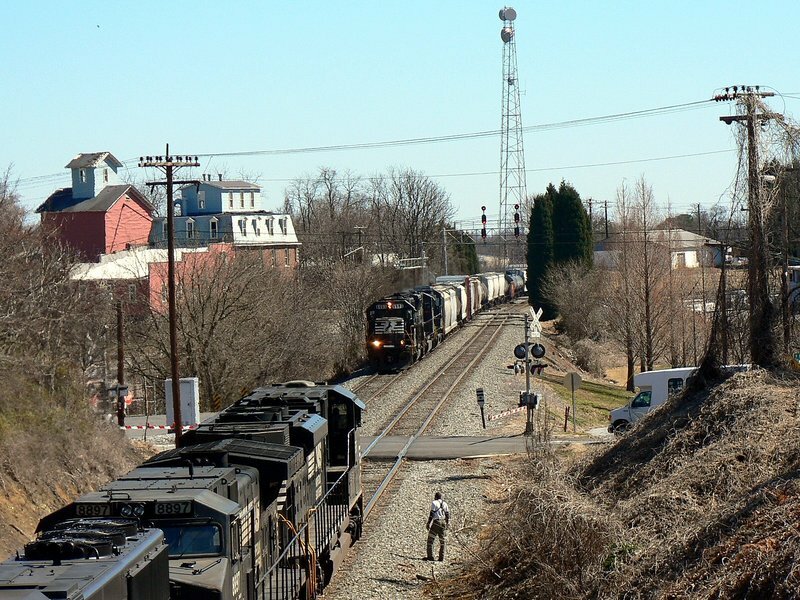 On this note, the targeted geographic area will be roughly a 1 to 1.5 mile radius from the heart of Salisbury to include the south region of Spencer Yard extending to Yadkin Junction at the south end of the old city limit. 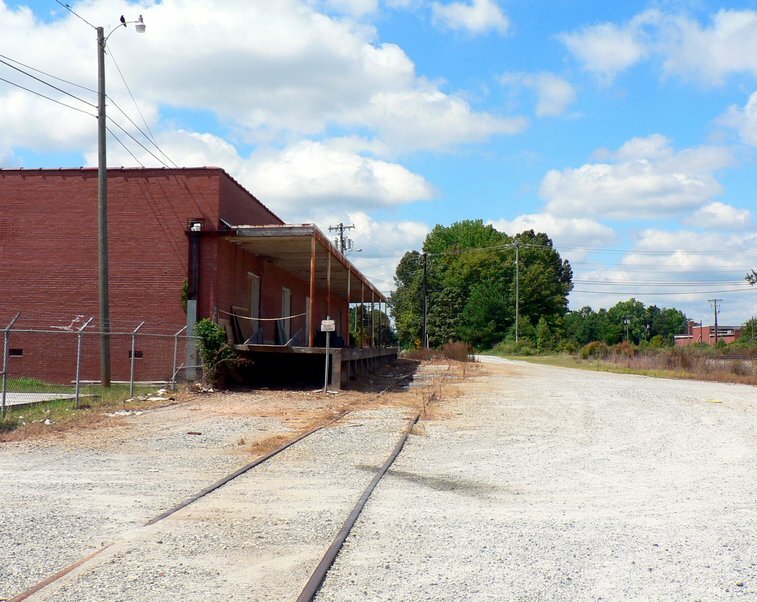 A small section of the Asheville main--originally the Western North Carolina Railroad--- and the East Franklin Street track to Kesler Mills will also be examined. As for the rail shippers of yesterday, there is a variance in the recorded history of these businesses. While there are ones that figured prominently in Salisbury economic history, others faded into oblivion many years ago. With that said, recorded history is more detailed about the landmark shippers while others is non-existent. There are instances of some of them still in existence today although transformed through the passage of time by expansion, relocation, or mergers. 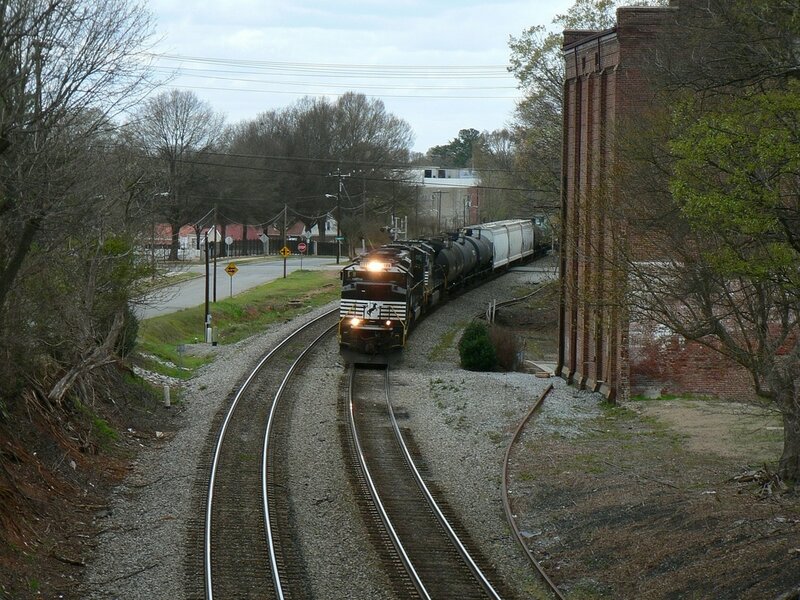 Against this backdrop, the focus here will be to include the rail shippers directly located within the old city limits of Salisbury as it was 100 years ago and the state of these sites as it is today. 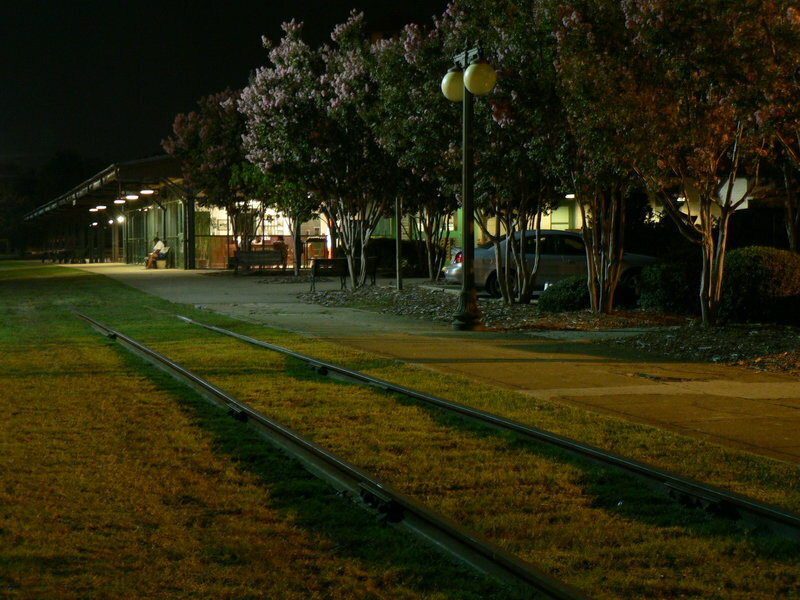 There are also examples of non-rail businesses included but due to their proximity along the right of way, are included because of the interrelation. In no way can this page be as comprehensive as I would wish but hope the reader will find some basic history of this region in the context of today satisfactory. 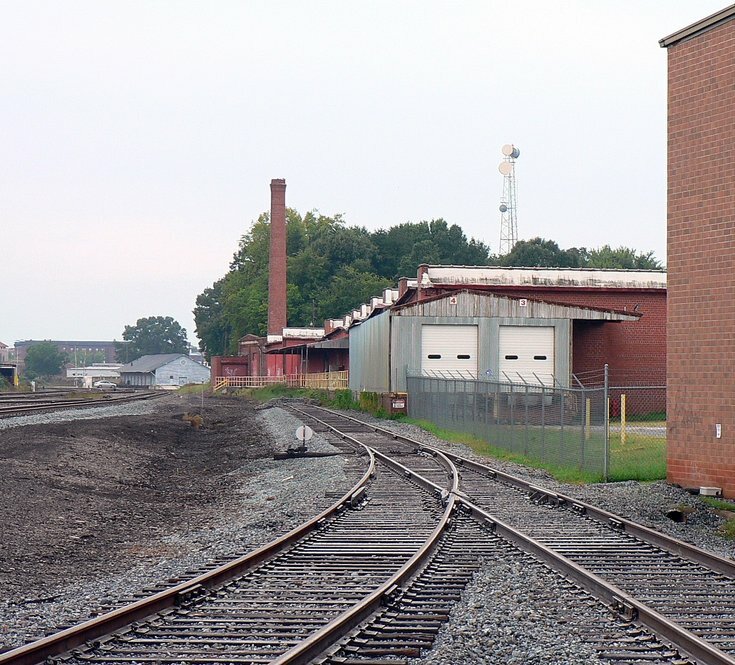 WVNC Rails includes dedicated pages about the Salisbury Ice and Fuel building and a description of Yadkin Junction on another web site page about that railroad. Rather than replicate information about them on this piece, the reader will find a link redirecting them to those respective pages if they so choose. This will be found in the geographic sections where they are located. A note about the Sanborn maps used herein. They are quite large in size and must be kept in that format to discern the miniscule details that are listed. Due to size limitations on this page, however, the maps have been reduced in pixels to the largest compatible size that will format correctly here. The unfortunate trade off by doing so is the reduction of detail that will not be fully legible. 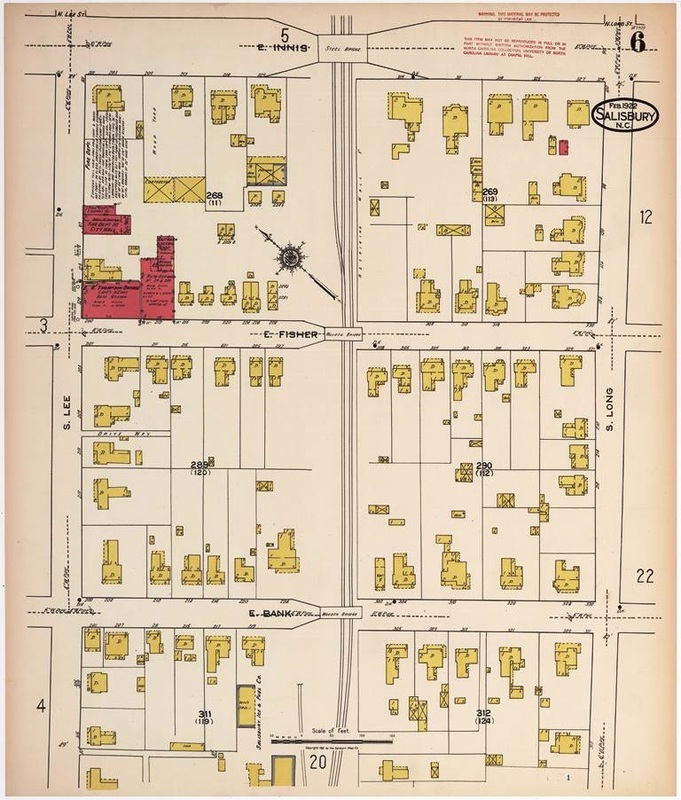 Several of these maps with multiple structures will include numbering of a specific business or location with a description identifying it below. A map showing the Salisbury-Spencer border area as it was in 1922. Of notable interest here is the southern end of the old Spencer Yard and the Vance Cotton Mills. During 1922 and for decades beyond, the region of north Salisbury adjacent to Spencer was a hotbed of activity. Before the construction of Linwood Yard during the 1970s, the yard at Spencer was the primary staging point for all local operations. All of the long distance trains either originated or terminated here which also includes any passing through that required servicing and primarily during the steam era. Spencer Yard today still consists of multiple tracks used for car storage and a staging point for bulk trains such as coal or ethanol. It is also the home base for NS trains PL05 (Salisbury switcher) and P92 (Yadkin turn). But although still relatively active at its south end, the yard is far removed from its peak when it was the primary yard predating Linwood. It has been downsized in the plant as well with numerous tracks on its west side having been removed and track realignments made. 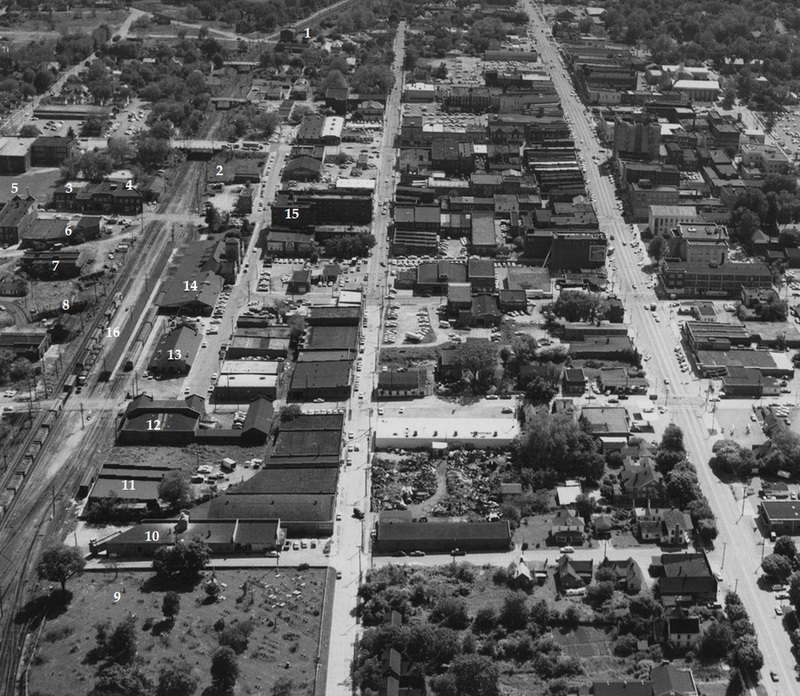 The 11th Street area was constantly busy around the clock. 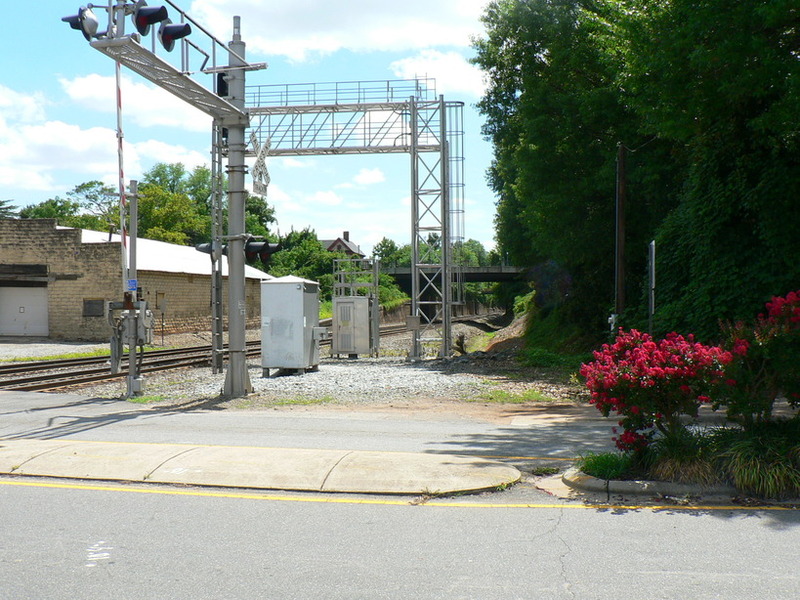 At the south end of the yard, inbound and outbound trains to and from points south of Salisbury or from the Asheville main would be steady. The numerous local trains switching the area mills and other industries added to this traffic and the classification of cars for this purpose was perpetual. Once such shipper adjacent to this activity was the Vance Cotton Mills which received its share of freight cars for many years. 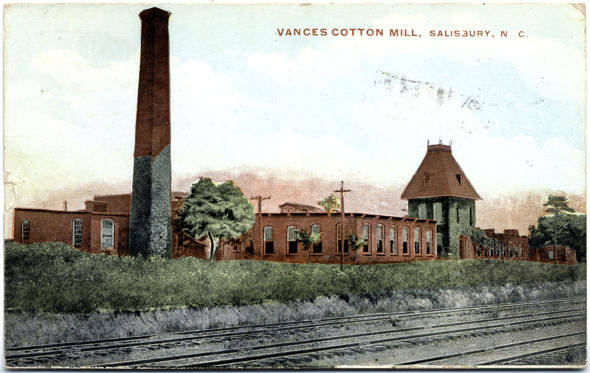 Vance Cotton Mills began operation in 1891 with 10,000 spindles and the business operated at this capacity until the 1931. It was at this time that the business was sold and the name changed to Cartex. Further expansion followed and at its peak, employed nearly 300 workers. Operations remained constant for the next 60 years with the exception of employee reduction until closing in 1990. Once Cartex ceased operation, the building was sold and reopened under the name of Superior Yarns. By the late 1990s, the textile industry was in rapid decline due cheaper imports and the company filed for bankruptcy in 2001 with production ending a few months later. 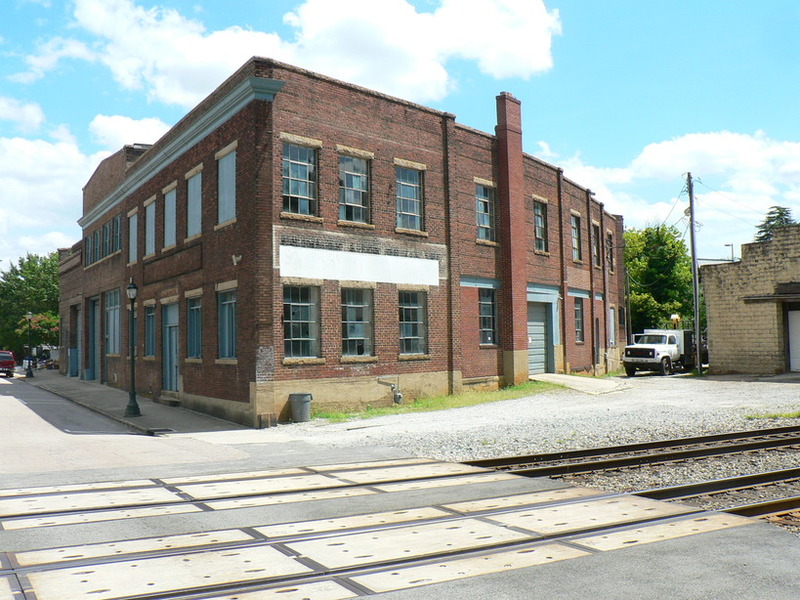 Ownership of the vacant building reverted to Rowan County and Salisbury but for a short tenure. The century long chapter of the Vance Cotton Mills and its successors ended in December 2002 when the old building was gutted by fire. Today only an empty lot remains where the structure once stood. 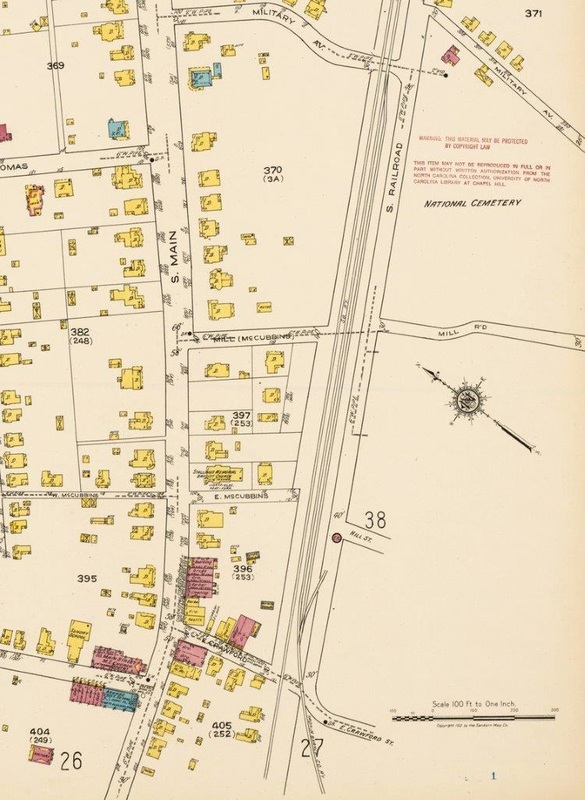 A discrepancy exists with the 1922 Sanborn map and the streetscape of today. The Vance Cotton Mills address was 1353 North Lee Street; however, the road today where the mill was located is named Richard Street. It appears that the street was renamed as there is still a North Lee Street a block away. In any event, the century old map is different from the physical layout as it is now. This region centers on the railroad apex of Salisbury. The wye is the centerpiece here as the junction of the Southern Railway Washington -Atlanta main running north and south and the diverging east-west route to Asheville. 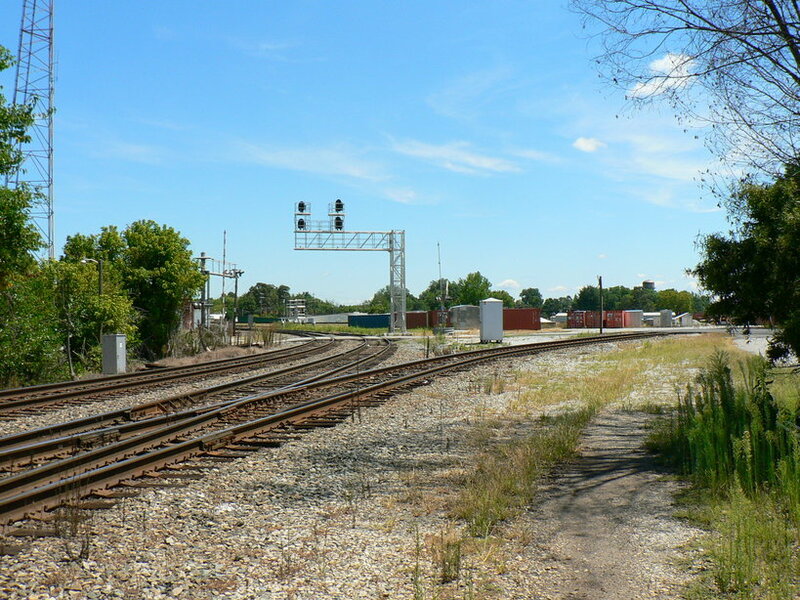 Multiple tracks dominate the sector here from the south end of the Spencer Yard and continuing to the wye area south to the Salisbury passenger station. Additional spurs within the wye and to shippers from the main lines also populate the area most notably along East Franklin Street. Moving south from the 11th Street region the railroad continued as multiple track mainlines and further expanded once at the wye vicinity. Curiously, the area flanking either side of the tracks here was undeveloped or not documented during the 1922 era. A look at this area today is a revelation in what business located in this sector dating from the mid 1920s forward. Most of this region is now mired with obsolescence but with nearly all remnants intact. 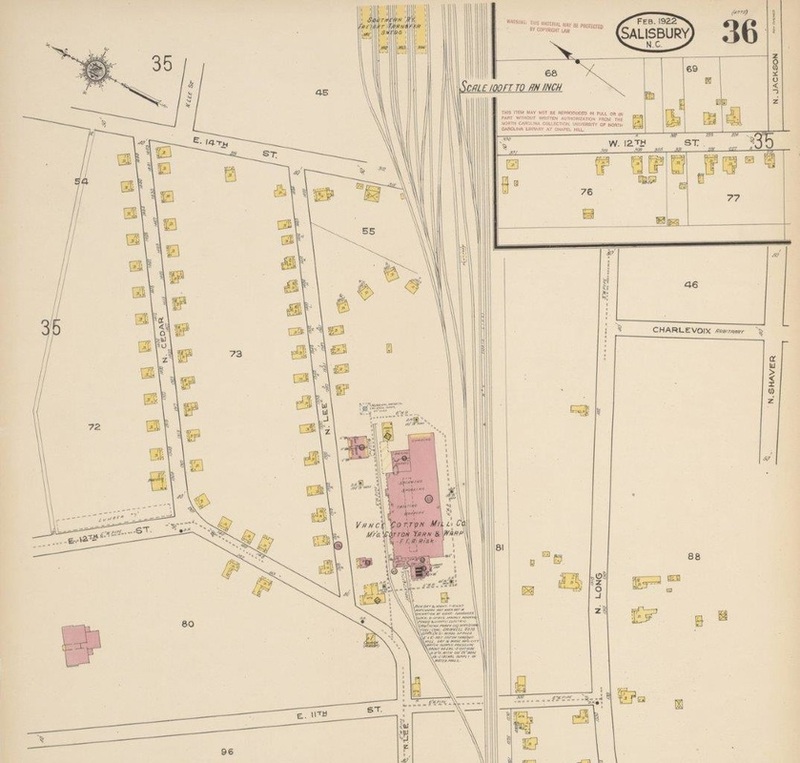 On the Sanborn map above, it is identified as #1 which as to include both sides of the railroad. As a sidelight, there has been minor street modification in this region differing from how it was a century ago and especially in the case of North Railroad Avenue. 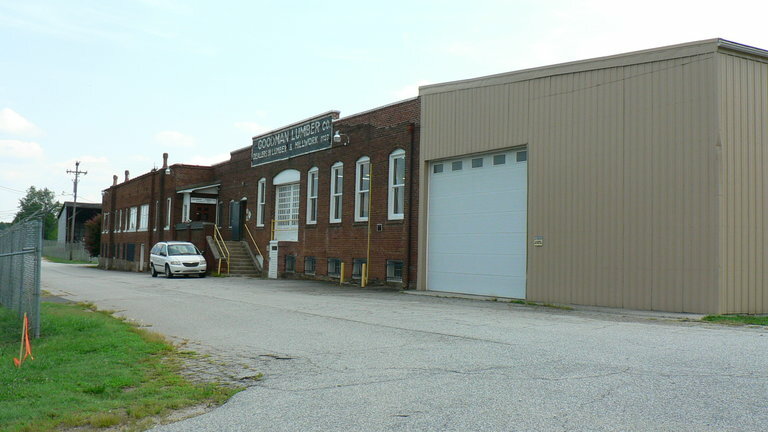 Without question, the most visually noteworthy industrial structure along the railroad in the heart of town is the Salisbury Bonded Warehouse building. 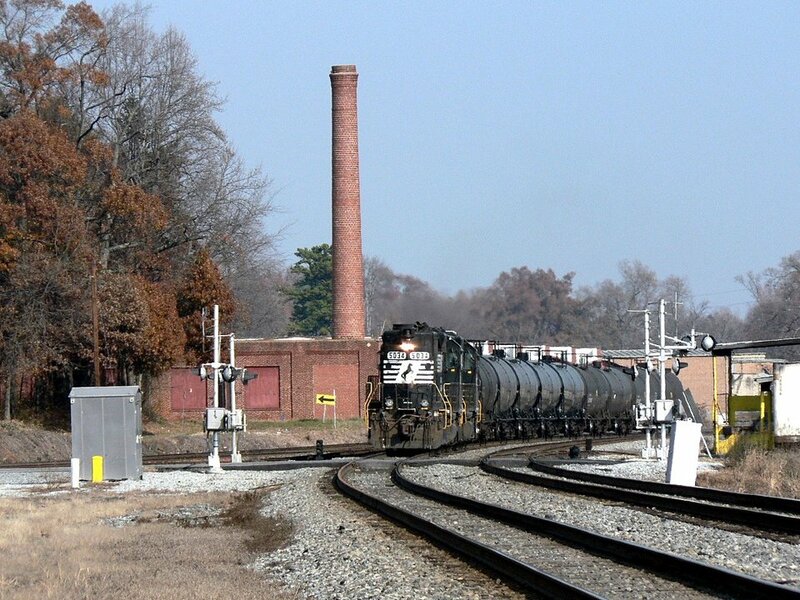 Its brick construction, sheer size, and towering smokestack dominate the scene and presents a stark contrast to modern Norfolk Southern trains and developments along the right of way. Its strategic location in a high density area of rail enthusiast interest has endeared it to the camera lens ad infinitum. Future historians will face no difficulties locating an image of this building. 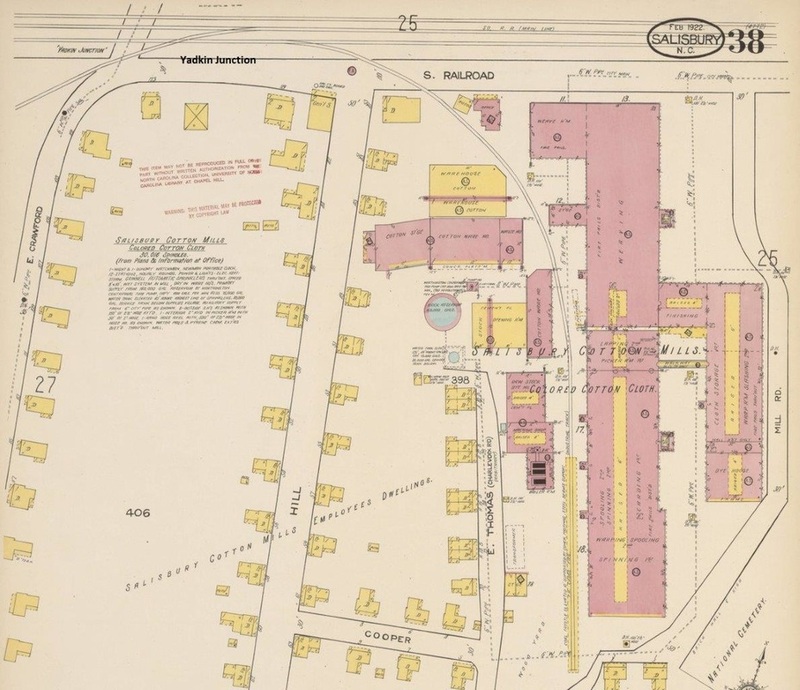 The Salisbury Bonded Warehouse inexplicably does not appear on the 1922 Sanborn maps although it was constructed in 1920 and later expanded in 1950. Its primary purpose was the storage and distribution of cotton bales for the area textile mills. 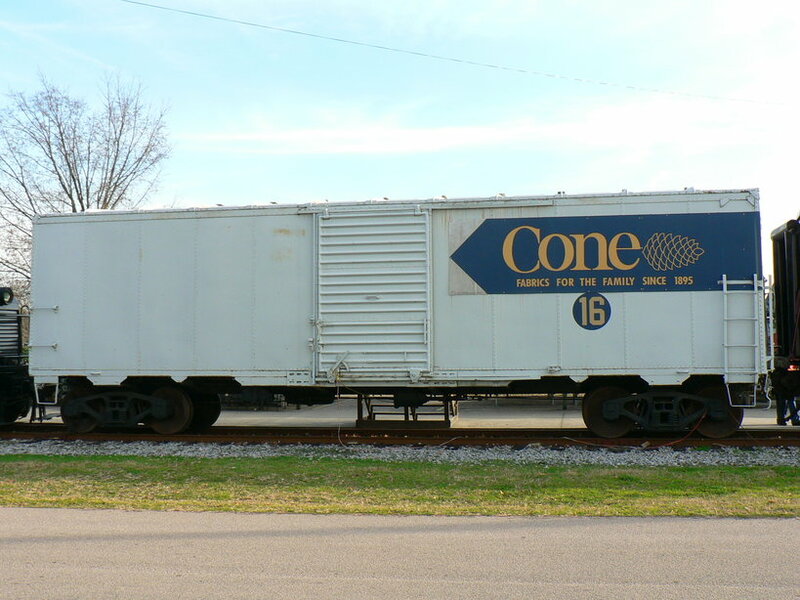 Raw cotton would arrive by rail and henceforth trucked to the regional mills such as Vance and Kesler. With the demise of textiles, it no longer fulfills this role and has been dormant to the railroad for many years. Today, it is partially rehabilitated for other uses and of this writing, is on the market for sale. On the east side of the mainline directly opposite the Salisbury Bonded Warehouse is a group of buildings relatively new to the scene. This region along the railroad between 11th Street and East Henderson Street was an open field dotted with a couple houses in 1922. It was not until the 1960s extending into the early 1970s that rail shippers located here built in the lower profile, utilitarian type of block architecture. Among the group to locate here was the Frito-Lay Company, Carter Furniture Company, and later, a recycling business. All of these businesses received boxcars laden with the respective goods for shipping for distribution or processing. 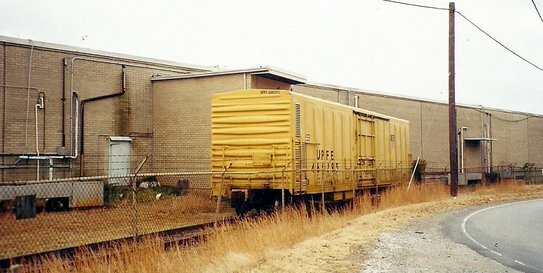 By the late 1990s, all became dormant by either relocating the business or ceasing shipping by rail. Two sidings served these shippers and are in dilapidated condition today. In fact, the switches have been removed no longer connecting to the mainline. In regards to structures, the Salisbury freight station was the focal point here for many years dating to the early 1900s. Ideally situated to handle incoming car loads from either mainline, it was a busy location for the transfer of goods from the rail to local commerce. 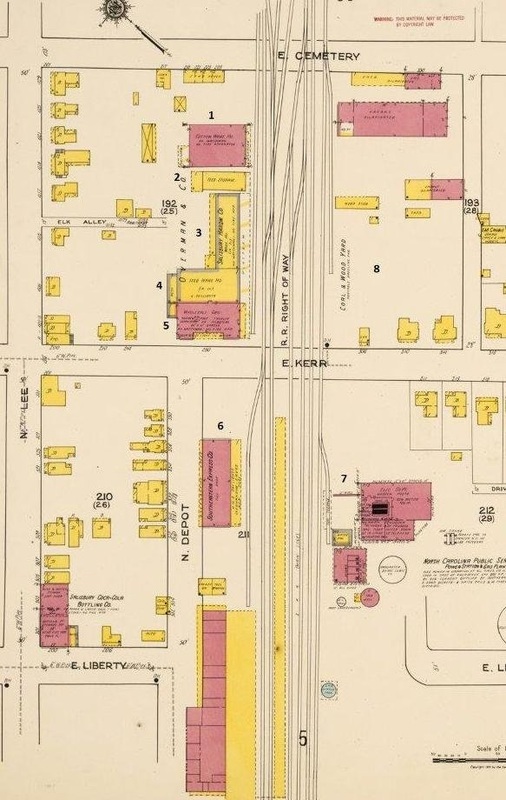 Multiple tracks existed at the front of the building adjacent to the north-south main in addition to a large platform shed although this was gone by 1913. By the 1960s, its importance had faded as local businesses not directly served by rail switched to trucking. During the following years, the structure ran down and became an eyesore and magnet for the homeless. In its final years, independent businesses briefly shared the space and after their departure, it became a popular hangout for train watching. In 2012, Norfolk Southern demolished the decrepit yet historic building leaving only a concrete dock. Ironically, the remaining track that served it still remains. Eye catching about the Salisbury wye on the 1922 Sanborn map is the number of tracks in existence during the time period. In addition to the mainline tracks on the north-south and westbound routes, additional stub end spurs existed within the wye area and at the freight depot. 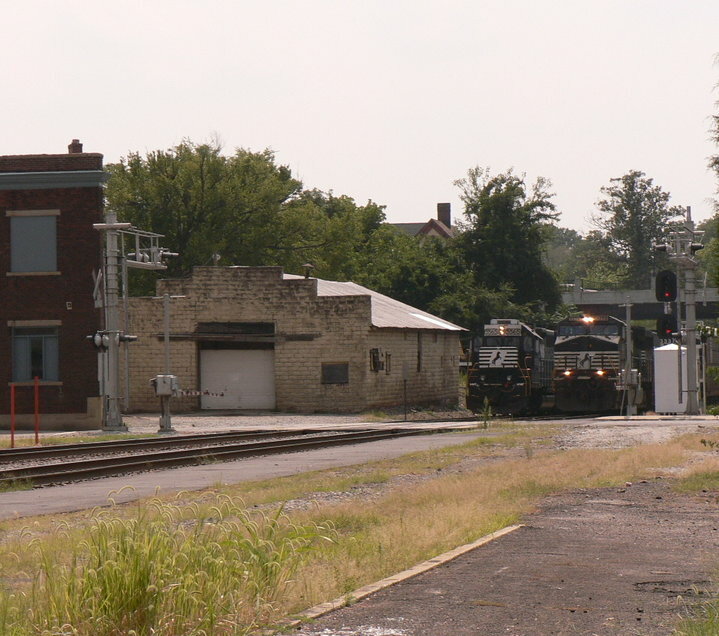 A number of railroad utility buildings were located within the wye area used for storage. At this date, there was one mainline track on the north leg of the wye and two on the south leg. The two tracks on the south leg accommodated freight and also the movement of passenger trains to and from the Salisbury station. 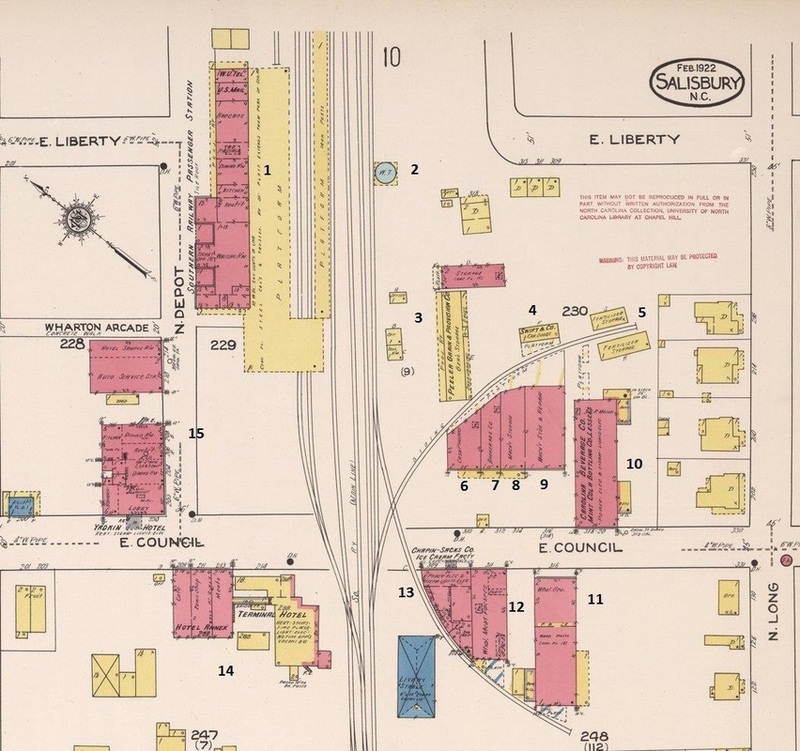 There were parallel tracks located at the freight station between the building and the north-south main that handled the storage of freight cars for loading and unloading. A century later, the wye remains an important junction for two mainlines although with differences. In direct opposite to 1922, the north leg now consists of two tracks whereas the south leg is only one. The reduction to a single track on the south leg is in correlation to the loss of passenger trains to and from the station and the sidings from this area south to East Kerr Street. In the scope of modern operations, Norfolk Southern has added signals on both legs of the wye although at the time of this writing, are not yet active. This is in conjunction with the railroad replacing old signals along both mainlines as well as the reinstallation of double track mainline at points north and south of Salisbury. The south leg of the wye until recent years saw only limited use except for local switching and the turning of locomotives. 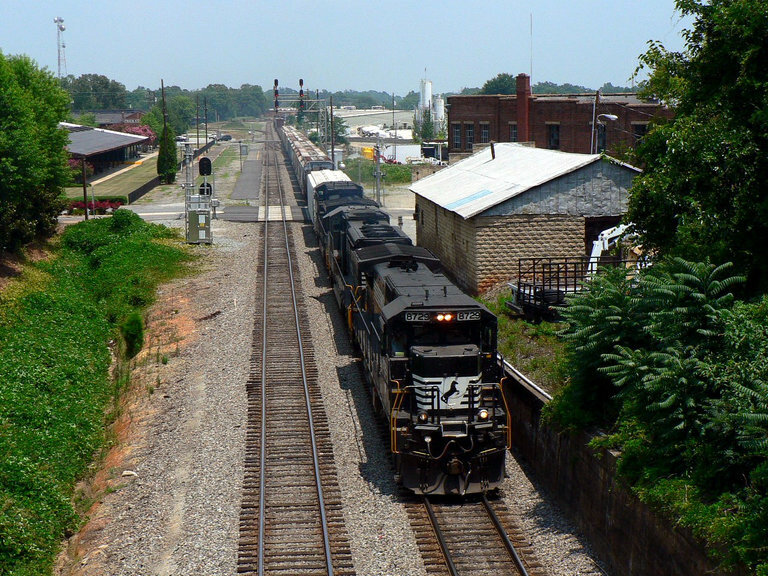 In December 2001, NS closed its line over the legendary Saluda Grade between Spartanburg, SC and Asheville prompting the rerouting of traffic. 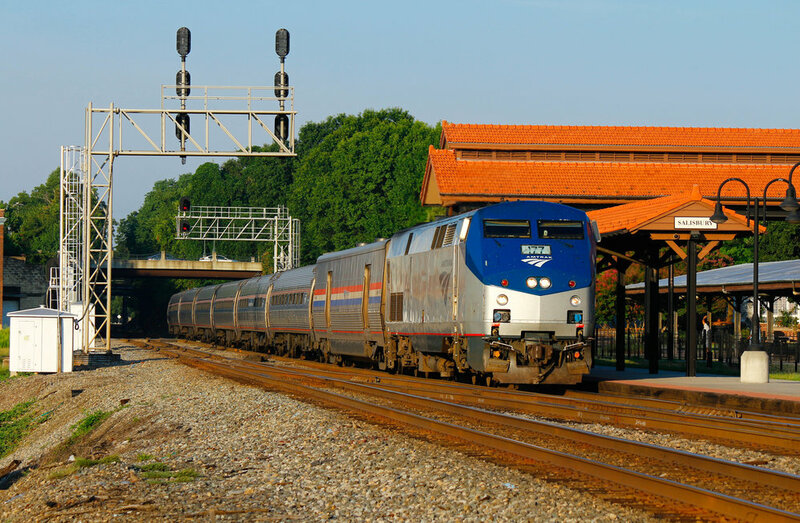 Instead of the more direct but tortuous route between those points, the railroad opted for the longer but easier route between Spartanburg and Asheville via Salisbury thereby increasing traffic volume on the Salisbury-Asheville (S) line. Although obviously not railroad related, any discussion of the wye area would not be complete without mention of the Lutheran Cemetery. This hallowed ground of Salisbury is quite old dating to the early 1800s with founding fathers of Salisbury laid to rest here as well as the remains of Confederate war dead. Enclosed by a brick wall, the solitude within contrasts with the clamor of the passing trains and vehicular traffic. 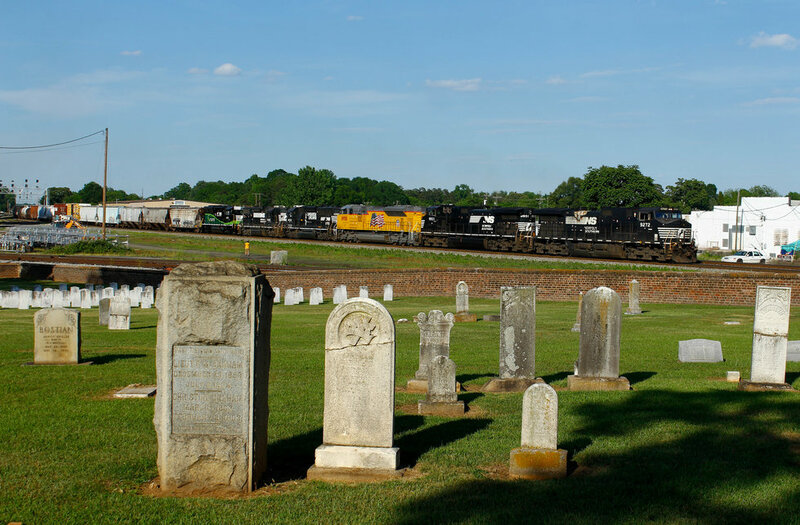 The cemetery adds significantly to the atmosphere and setting of the railroad reminiscent of an era long past. This page will continue with a brief detour on the Asheville line moving west from the wye then explore the spur that ran on East Franklin Street to Kesler Mills. It will then resume southbound through Salisbury. Moving west from the wye area, this section will explore approximately a half mile stretch along the Asheville line as it was within the city limits in 1922. Beginning at the wye on the west side of North Lee Street, this pocket will include the rail shippers that existed extending to the West Cemetery Street region. Of all the sectors as they were in 1922 as compared to the present day, this one contains the fewest remnants of a century ago whether it be sidings or structures themselves. Unquestionably, the most notable shipper on this stretch was Grimes Mills. The Asheville mainline through here---built as the Western North Carolina Railroad during the late 1850s into the Civil War years--- is remarkably similar today as to what it was in 1922. A notable exception is the single track section between the wye connection and the North Church Street grade crossing. The double track began here and reverted to single track at the location known as Majolica to the west. In contrast, all of the sidings depicted on the map below no longer exist. 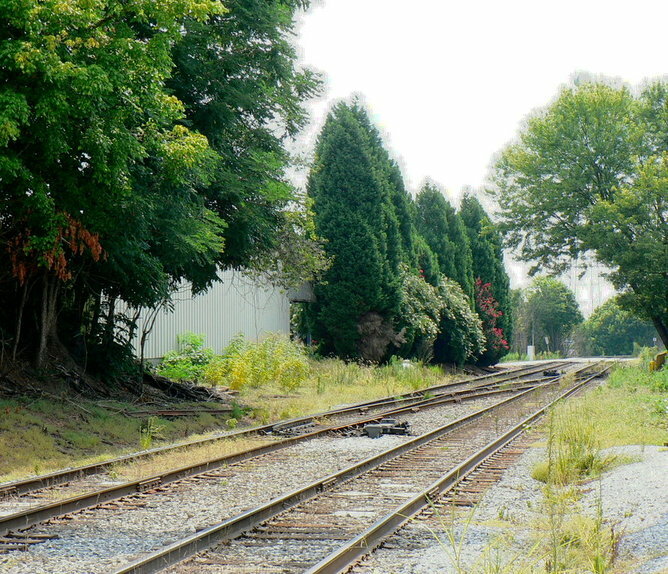 Diverging onto the Asheville mainline, this area featured several rail shippers as they were in 1922. 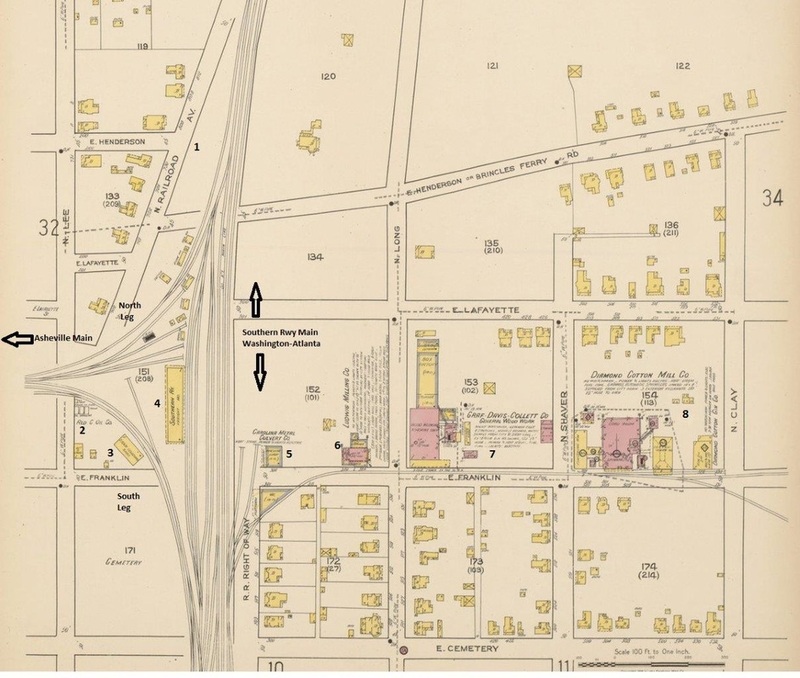 Only one of these buildings remains standing today and all of the sidings on this map vanished into history. 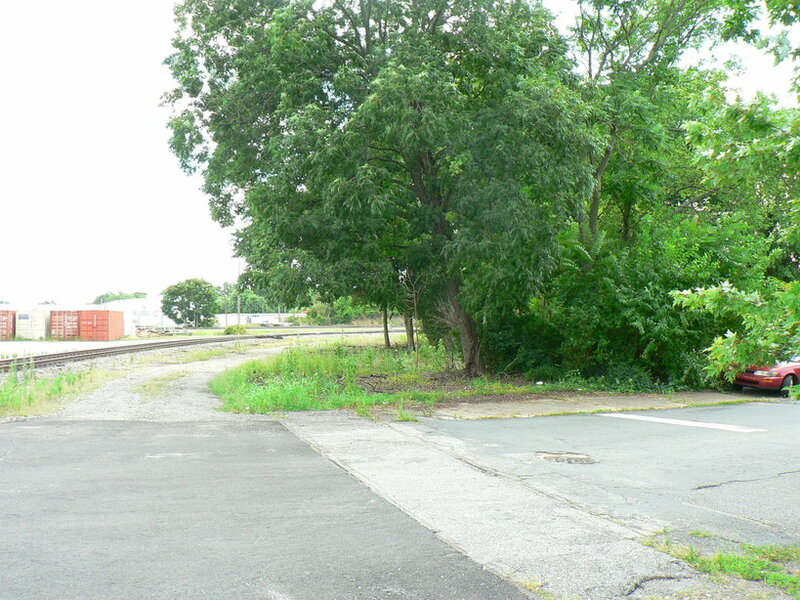 There is little reminder at what is now an asphalt lot at North Lee Street and the grade crossing of what once occupied this lot and field. 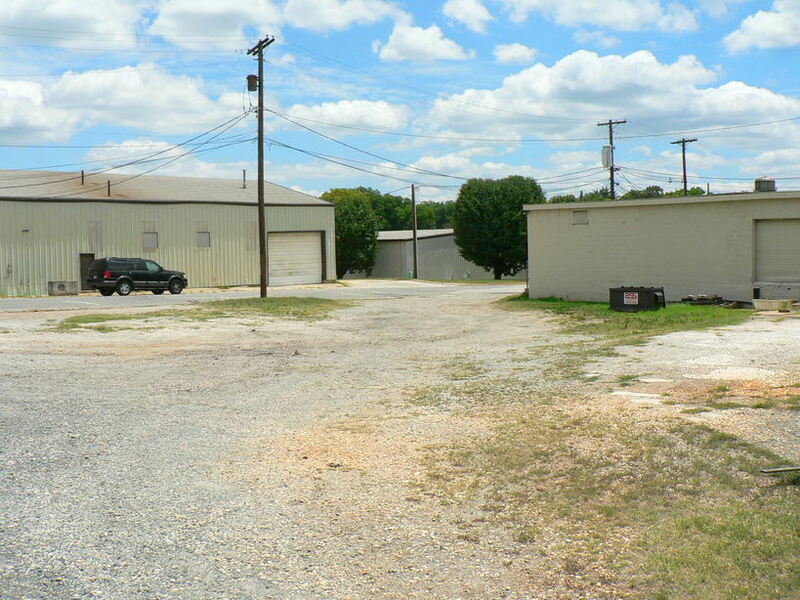 During 1922, a warehouse, coal yard, and oil distributor were located here served by a pair of sidings. 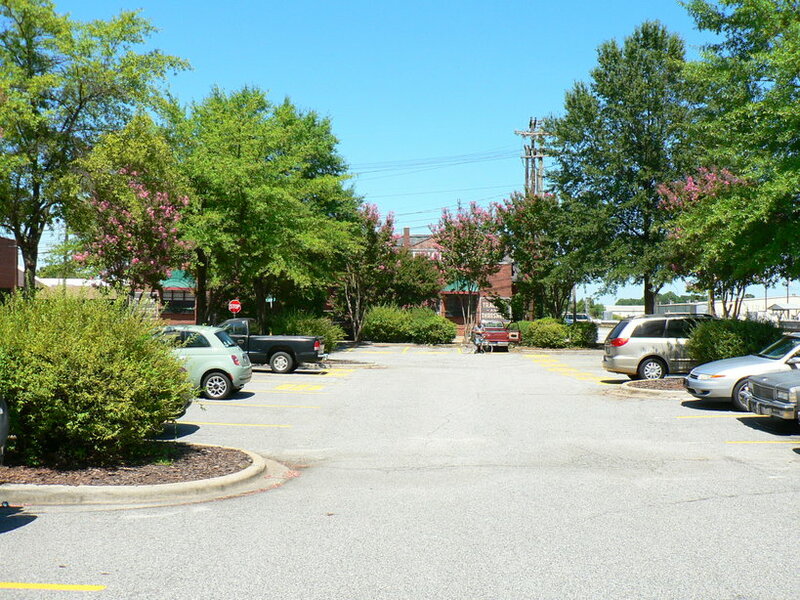 Located directly at the west corner of North Lee Street and the railroad and served by a short siding was the Emerson Brantingham warehouse which under this name, was a distributor of farm equipment and also used for general storage. This company remained in business here until 1928 when it was bought by Case. 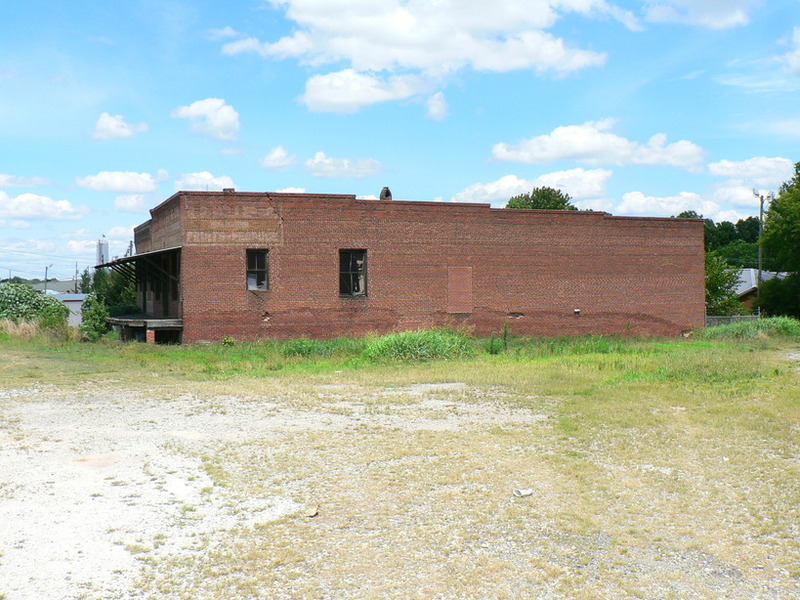 In 1932, this building was purchased by Thomas & Howard, a large regional grocery distributor in both Carolinas, and remained under this operation until the 1970s. This structure was demolished circa 1980. As an additional note, Thomas & Howard also purchased two other old time Salisbury businesses that are mentioned on this page---Overman Brothers and the Peeler Company in 1930. 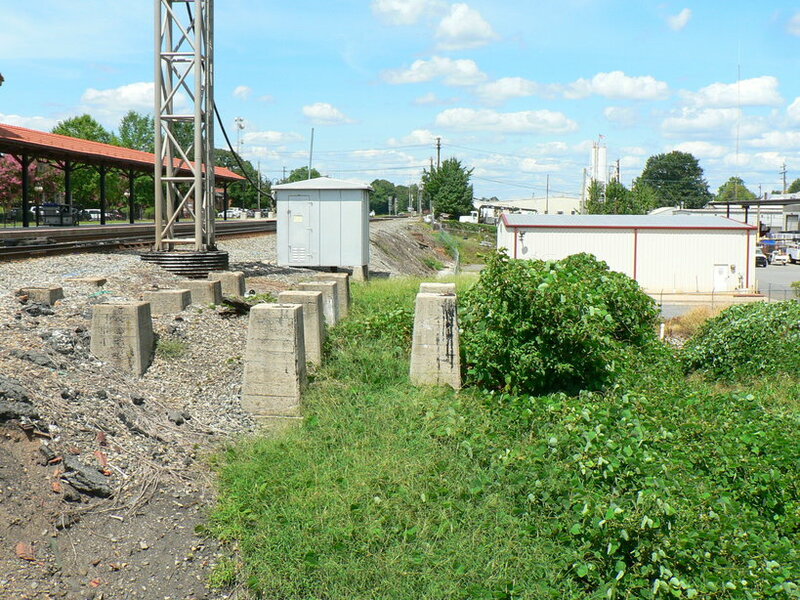 Directly west of Emerson Brantingham, a siding ran parallel to the mainline which served a small coal yard and at its end, the Texas Oil Company adjacent to the North Main Street grade crossing. These businesses vanished many years ago with nary an existing trace of their existence. All that remains today is a grassy field and old chain link fencing beside the railroad. The roadbed for the lone gone siding is also apparent. 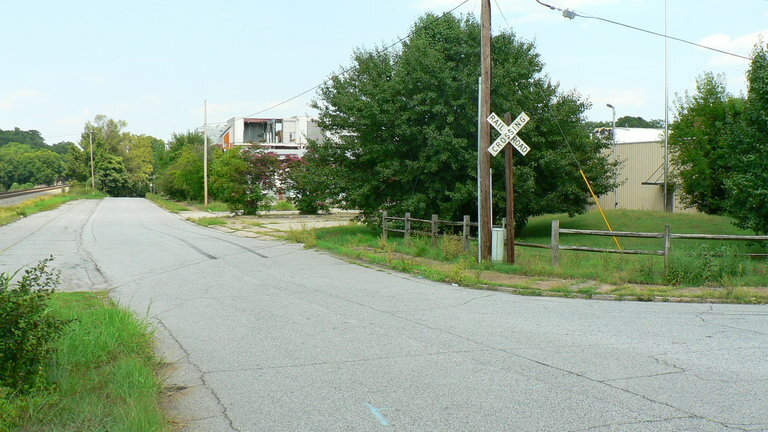 West of the North Main grade crossing on the north side of the railroad is the site of the former Rowan Grocery Company. The rear of this building retains its original brick wall but the track side of the structure had been modified with metal paneling. This building is easily overlooked today obscured by tree growth. 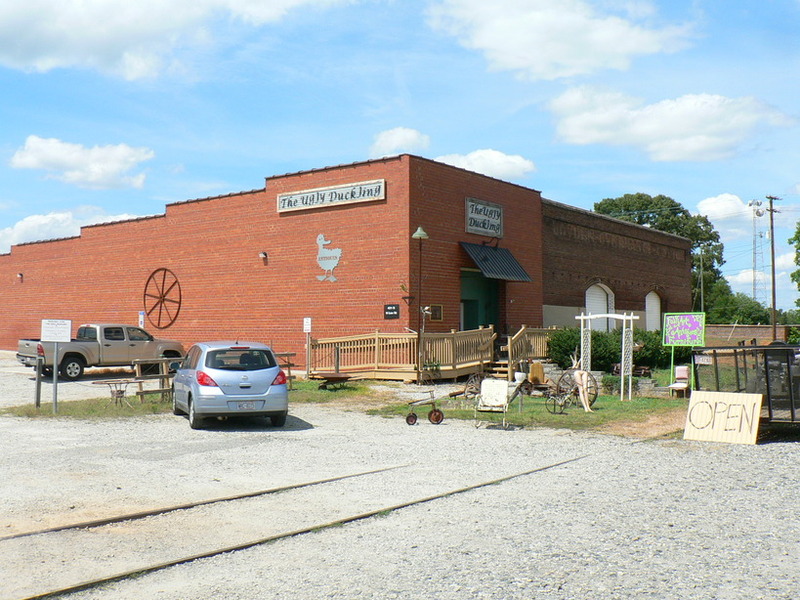 When the business was active, it was served by a siding that also continued to Grimes Mill to the west. No trace of the siding remains today except a small section at the site where Grimes Mill stood. Constructed in 1896, Grimes Mill was a landmark business during the early industrial era in Salisbury and remained a prominent structure on the landscape for more than a century. Existing in a period when feed mills were as common as the convenience store is today, it was notable for its longevity and intricate machinery inside. The mill was built by the North Side Roller Mills Company but within a decade was facing bankruptcy. In 1906, it was purchased by the J.D Grimes family and by 1912, expanded with the addition of twelve large storage bins for wheat with a capacity of 90,000 pounds each. Another addition was a small section used to produce meal and feed from Rowan County corn. 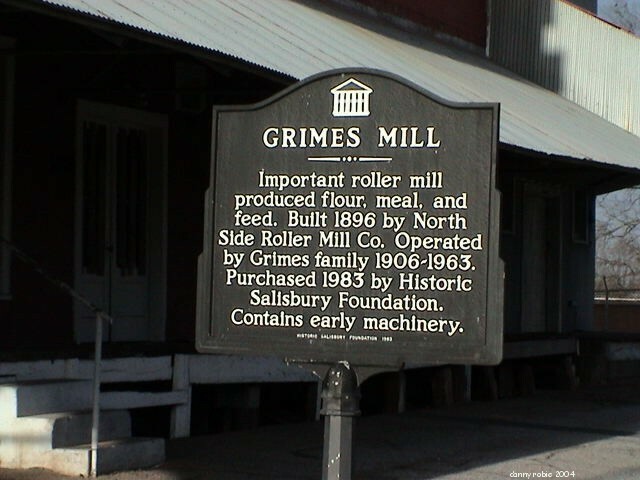 Grimes Mill reached its peak during the Depression 1930s producing 100 barrels of flour per day. During this era, local wheat merchants with wagons lined the North Church Street address selling the raw goods for processing. Wheat also arrived by railcars on the siding at the south side of the building. As with numerous independent mills, the onset of general decline precipitated by larger consolidations after World War II dramatically affected volumes. 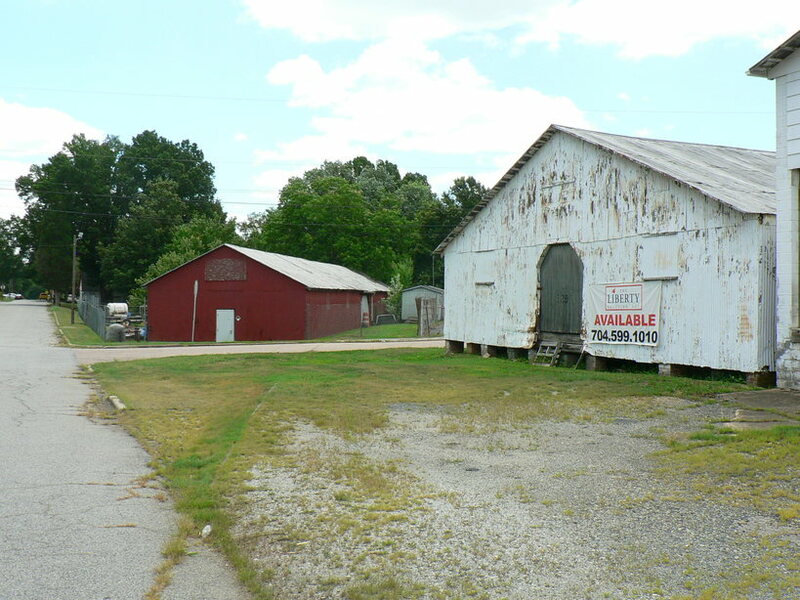 Also, the transition from agrarian to urban demographics adversely affected the industry and small operators such as Grimes Mill and by 1963, the mill shut down and the Grimes family sold the building. It was purchased later in the year with the intention of small scale operation and the addition of a retail store. 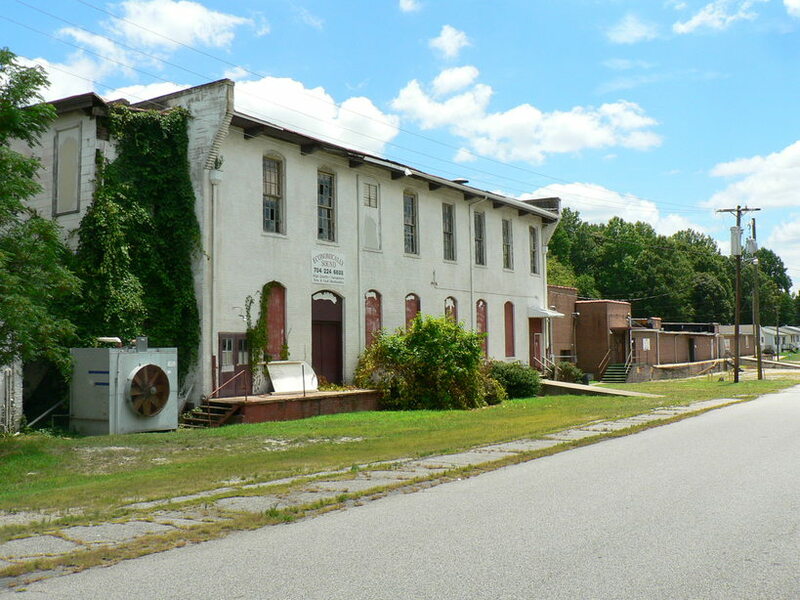 Salisbury lost a historic landmark on the night of January 17, 2013 when Grimes Mills was engulfed by fire. The cold night created an eerie atmosphere as the old building is lost forever in a blazing inferno. Salisbury Post/Rowan County Public Library. In 1982, the building was purchased by the Historic Salisbury Foundation and it assumed control with the intent of preservation beginning in 1983. It was ultimately added to the National Historic Register as a protected structure and listed as a historical attraction for the next thirty years. 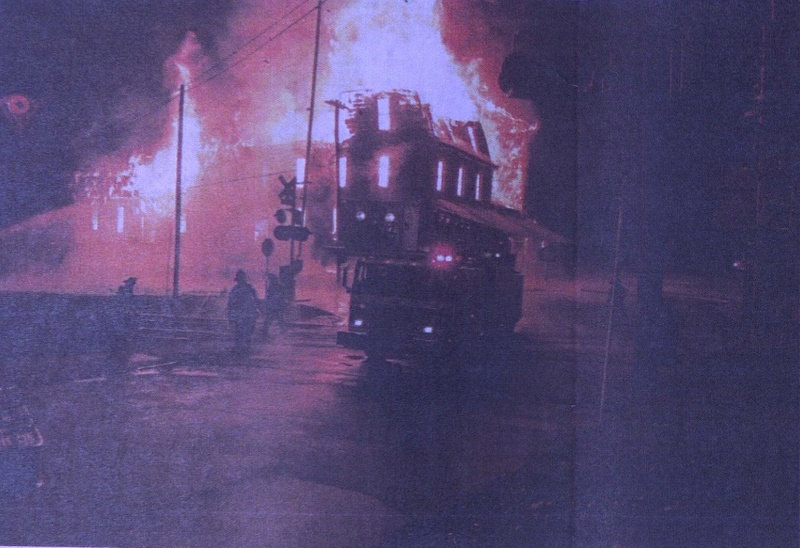 On the bitter cold night of January 17, 2013, Salisbury lost a landmark piece of its history when the Grimes Mill building was destroyed by fire. 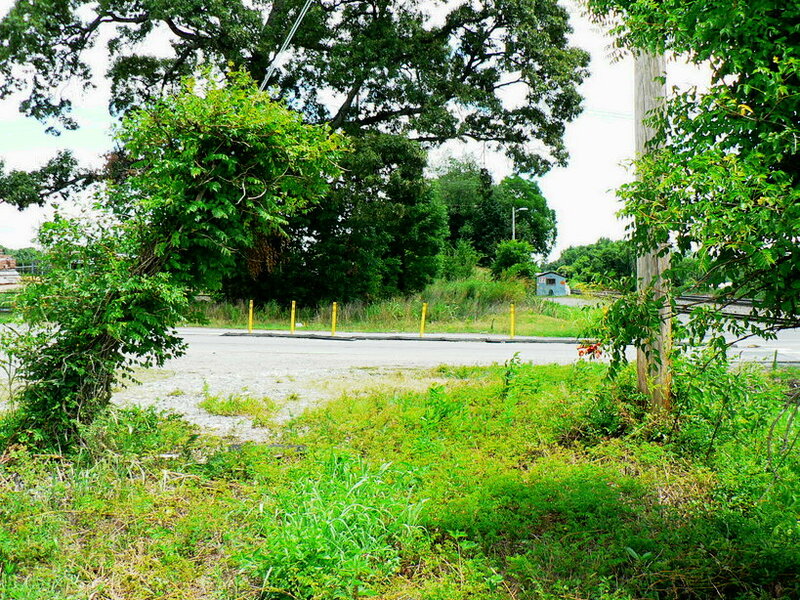 Today, the location is an empty lot listed for sale. Just to the west of Grimes Mill on the south side of the railroad was a siding that served two rail shippers. 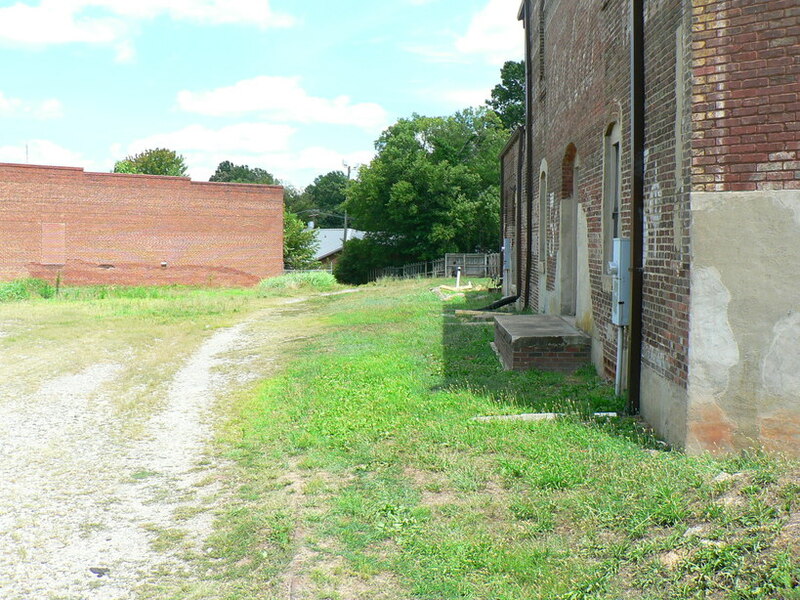 These two shippers, the Farm Power Company and Cobb-Mack Candy Company, faced West Cemetery Street. 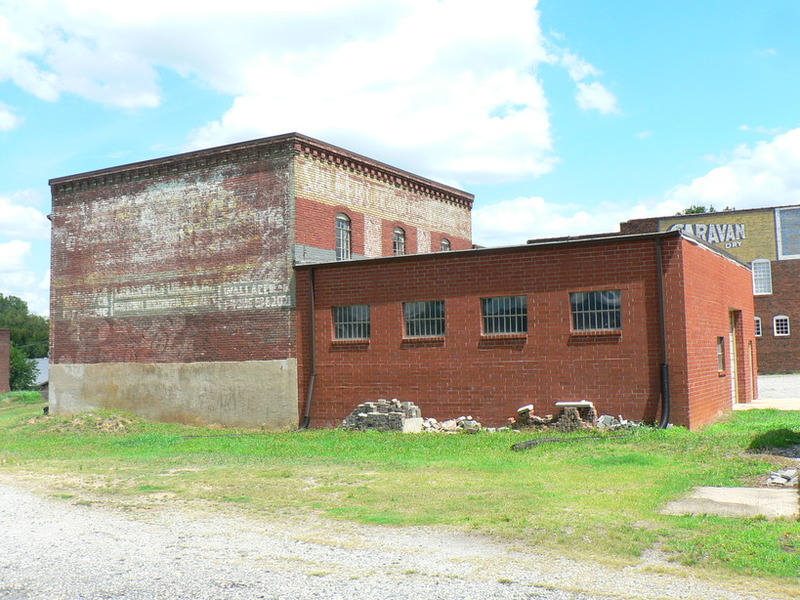 Today, this area has been transformed with the expansion of the Salisbury Water Works throughout the years but the old Farm Power Company building still exists. 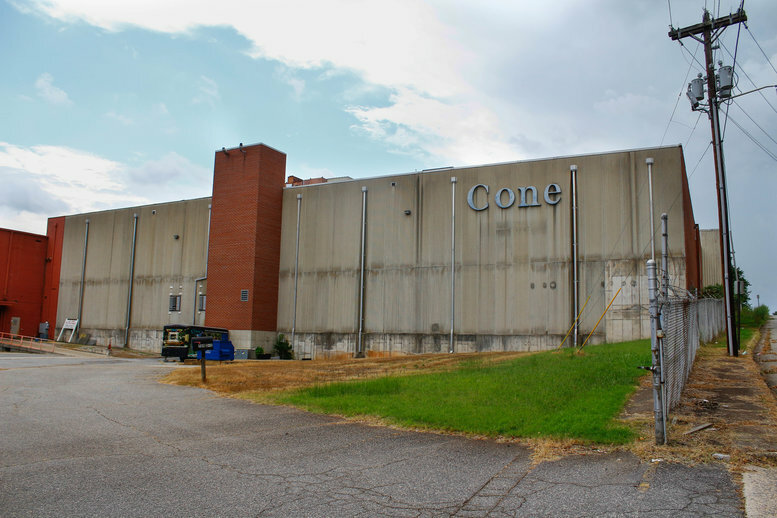 The site of the Cobb-Mack Candy Company has vanished into history, however--there is no trace remaining of its existence or the siding that served both businesses. 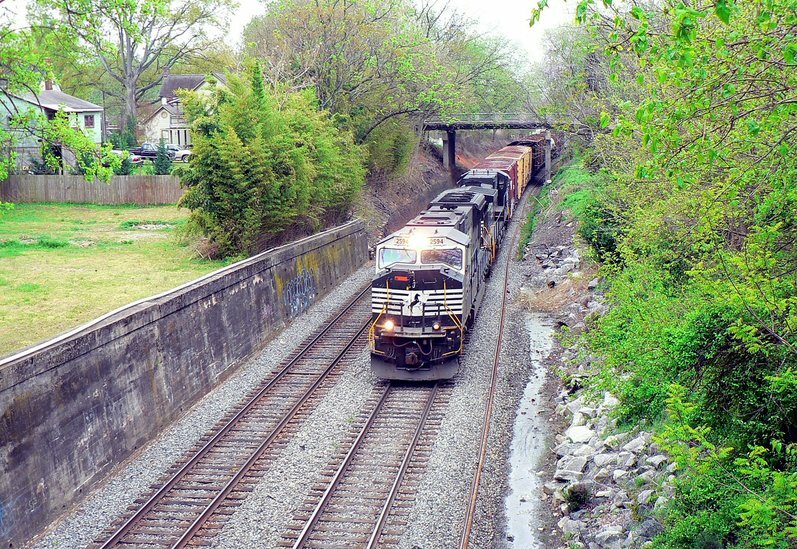 The East Franklin Street spur is representative of a time when rail shippers were located away from the railroad mainline right of way yet utilized or required rail service. These industries were constructed during an era when zoning laws were non-existent or in the least, somewhat relaxed. Another instance is no remaining real estate located along the railroad right of way for these businesses to locate and a track constructed to serve them after the fact. A modern day equivalent would be the construction of an industrial park away from the railroad main accessed by a newer track. In spite of the passage of the years, remains of the old East Franklin district still exist. The first two blocks of the street have been completely transformed in more modern times. 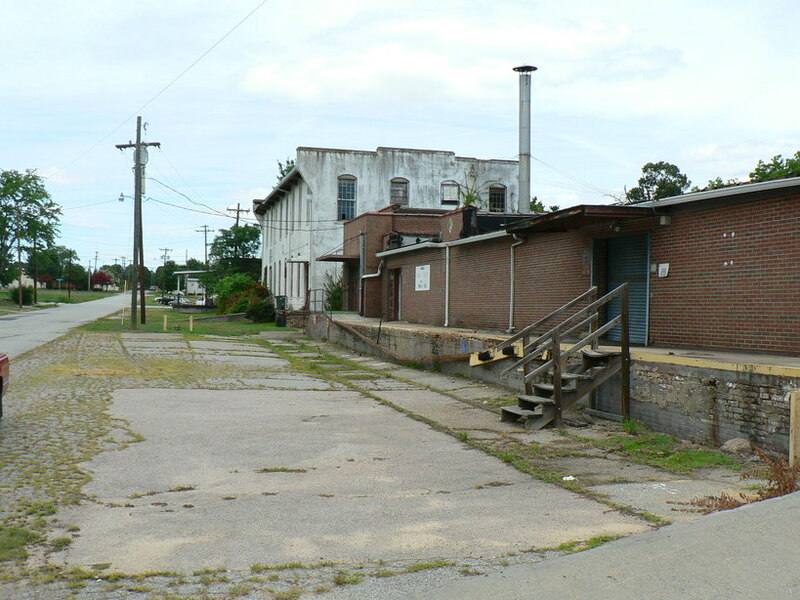 The Carolina Metals building and Ludwig Milling have long passed from the scene with those buildings demolished and replaced with new businesses that appeared during intervening years. On the corner of East Franklin and North Long, a vacant lot is what remains of the Graf-Davis Collett building. At the intersection of East Franklin and North Shaver begins the section where a piece of the past is still visible. 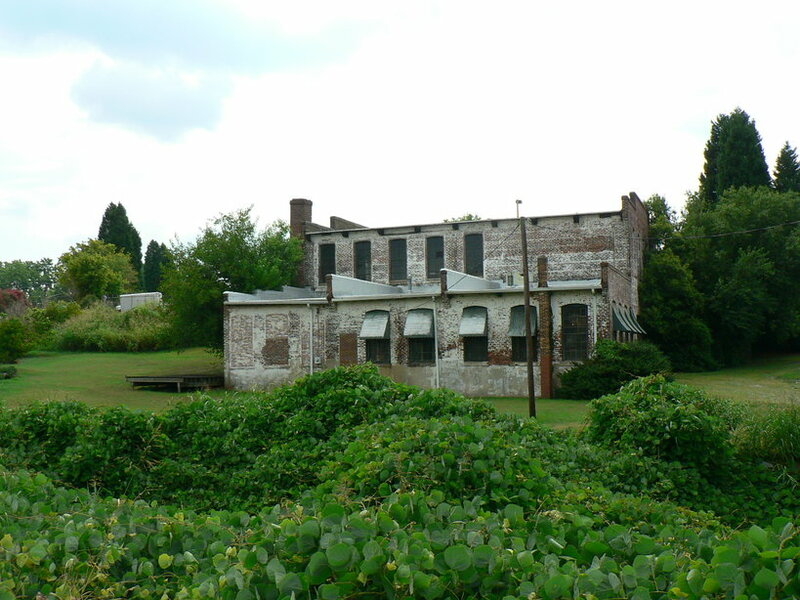 The old Diamond Cotton Mills building still stands and remains of the railroad can be seen. Running parallel to the street is the track that served the Diamond Mills and continued to Kesler Mills. 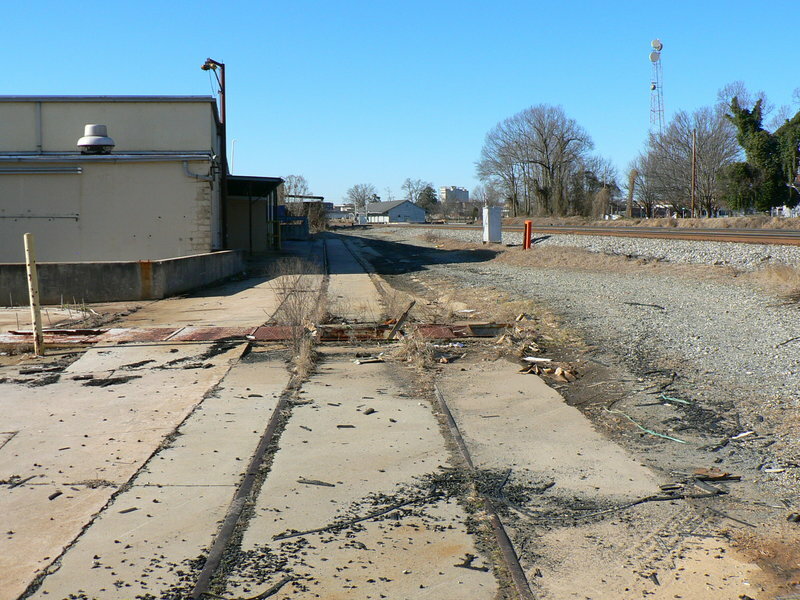 Track is still encased in the asphalt as the spur crossed the street and passed between two buildings---one a canning shed that existed in 1922--and passed through a small residential section to Kesler Mills. 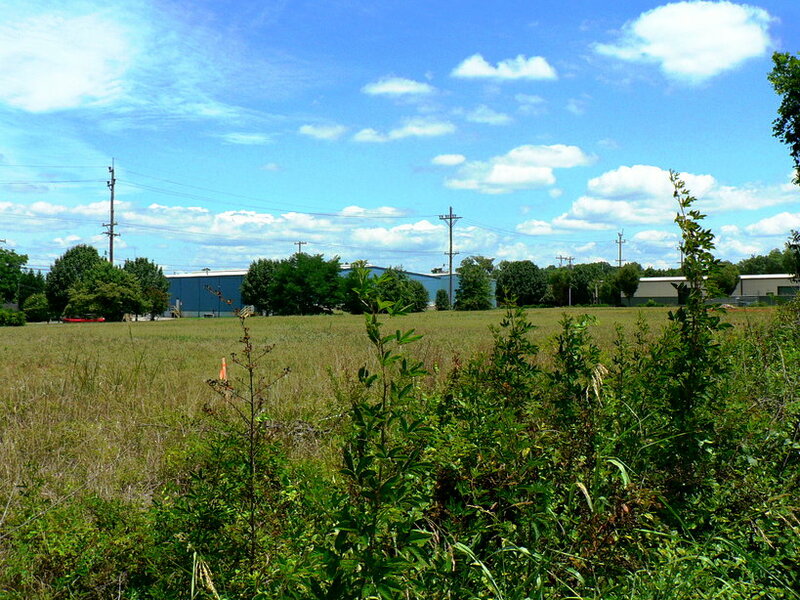 The old Kesler Mills site differs from the others because of its location away from the mainline railroad vicinity. 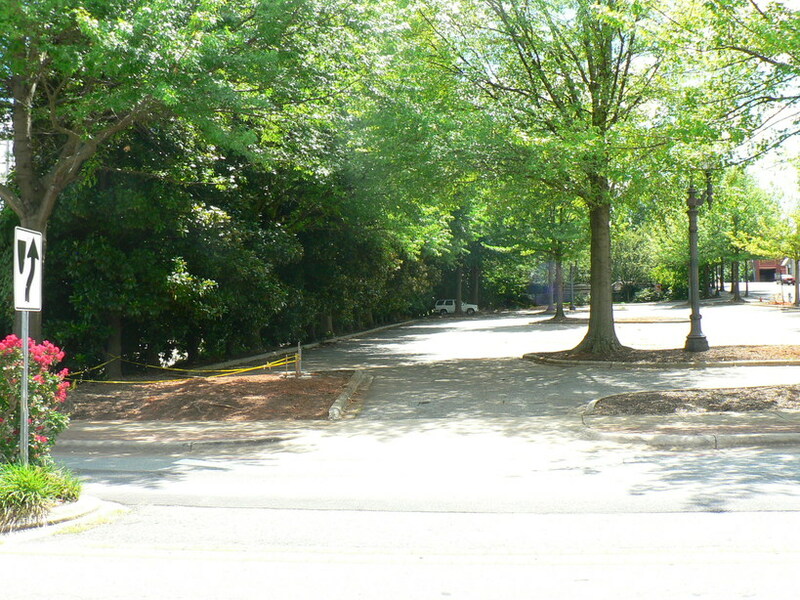 Served by a long spur, this track diverged from the main at East Franklin Avenue and paralleled this road for a couple of blocks crossing North Long and North Shaver Streets until reaching the Diamond Mills location. Here the spur briefly became street trackage until crossing over and passing through a short residential section. It then crossed North Boundary Street (Martin Luther King, Jr. Avenue today) where upon it entered the Kesler Mills plant. 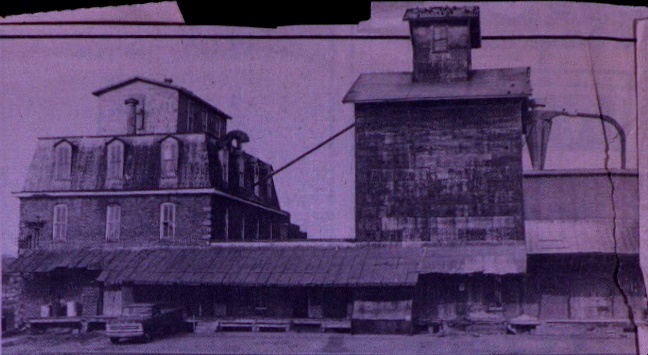 1895 was the beginning of Kesler Mill as it was organized and opened for operation that year. Consisting of 5000 spindles, it was among the group of smaller capacity mills during the period that saw the business struggle. It did incorporate the construction of houses surrounding the mill for employees—a concept that that would be placed into practice at many larger mills creating the origins of “mill houses” or “mill hills”. 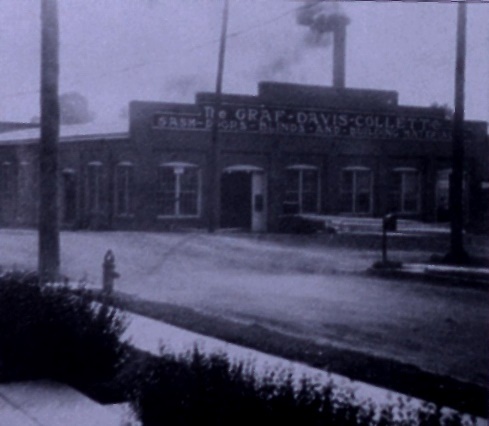 The Kesler Cotton Mills early in its history circa 1910. This business would change ownership and continued to employ Salisbury residents for nearly a century afterward. Postcard image courtesy Rowan County Public Library. 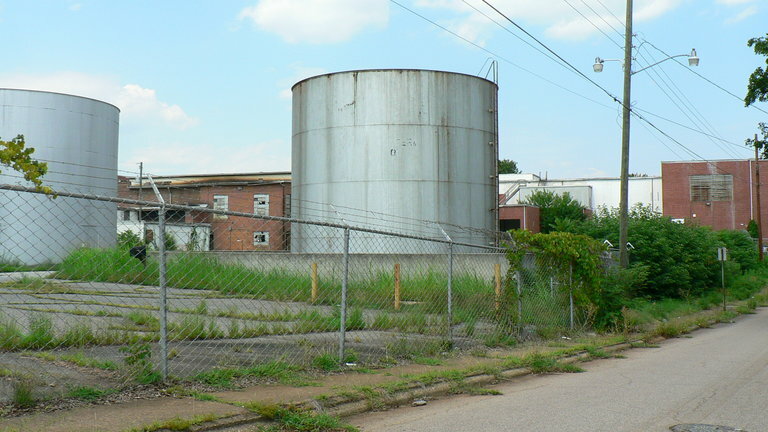 The remainder of its existence was cemented from the purchase of the property by J. W. Cannon, founder of what would ultimately become the Cannon Mills empire. Although under Cannon control, Kesler Mill retained its name until 1928 when it was incorporated into the Cannon Mills fold becoming Cannon Mill Plant 7. From this period forward, the old Kesler plant history mirrored that of the other mills within the Cannon Mills conglomeration. Operation continued under the Cannon name until 1986 when Fieldcrest purchased the properties. These properties in turn were purchased by Pillowtex in 1997 as a final chapter in the life cycle. By 2000, Pillowtex had filed for bankruptcy and the old Kesler Mill-Plant #7 was closed in 2003. The building has since been demolished and rubble from its ruins still occupies the site today. In an ironic twist, the old Kesler Mill building and to include mill houses within its realm was submitted for preservation under the National Historic Register during the early 1980s but obviously that was rescinded. The East Cemetery-East Kerr Street region as it appeared in 1922. Included is the north station area and the rail shippers and track layout as it existed in that era. This sector is still partially intact a century later with additions not in existence at the time of this map. Of the selected listed shippers above, several changed ownership throughout the years perhaps more than once. 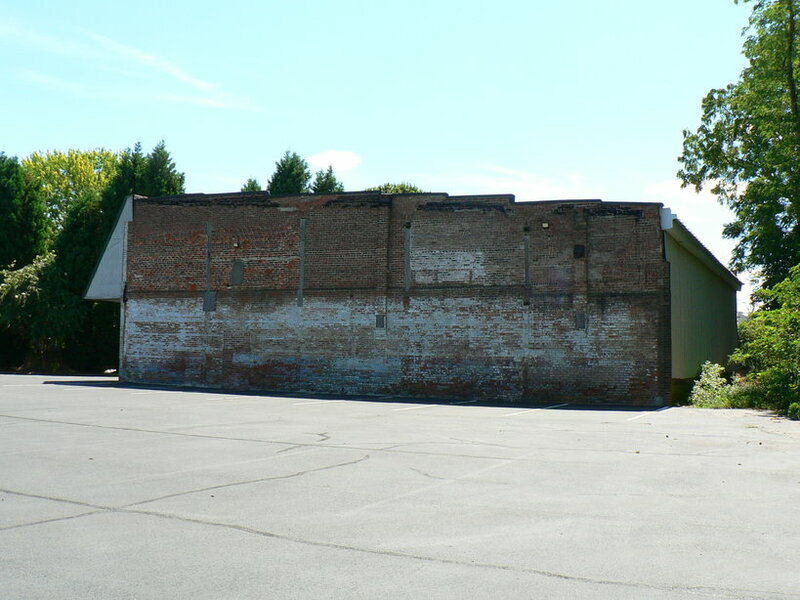 The siding that serves building #10 runs behind the old Salisbury Hardware (present day Salisbury Emporium) and crosses Kerr Street where it served another section of buildings. Out of service for many years now, the track has been brick paved and today is the Salisbury Historic Rail Walk. The region within the borders of East Cemetery and East Kerr Streets perhaps offers the best glimpse of what remains from old time Salisbury. There are still a couple of old siding remnants in place which complement railroad structures dating to the early 1900s. Post dating the 1922 reference specifically used on this page is a section of small shippers that once existed between the mainline and North Lee Street. Further adding a nostalgic atmosphere to this sector is the old Lutheran Cemetery which predated them all. Easily the most prominent structure on this block adjacent to the railroad is the one that houses the present day Emporium. It has undergone minor restoration but still retains the appearance of the early 1900s when it was a grocery warehouse. 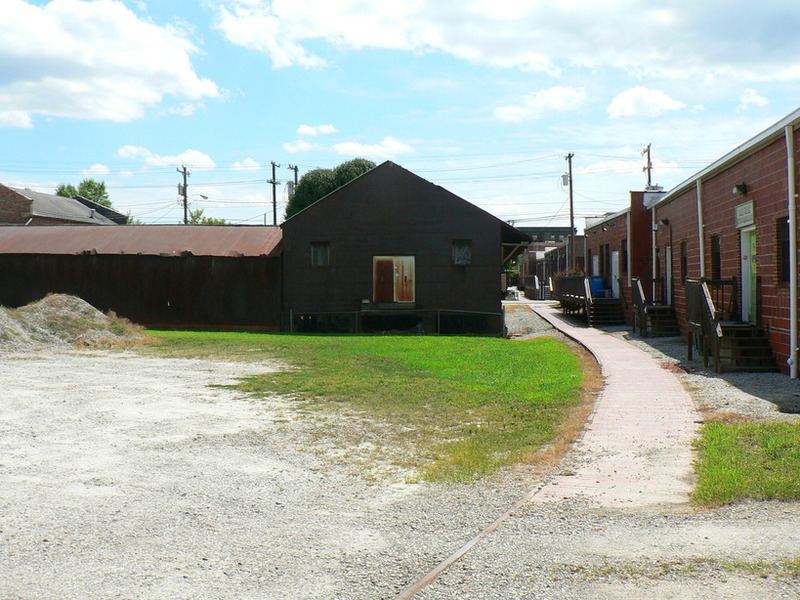 The connecting structure to the north is a former feed supply that is still intact to include the shed at its rear which borders the siding that served the North Lee Street district. Today a large gap---now a parking lot---exists between the feed supply building and the cotton warehouse bordering East Cemetery Street. This void was once occupied by the long vanished Salisbury Hardware building. 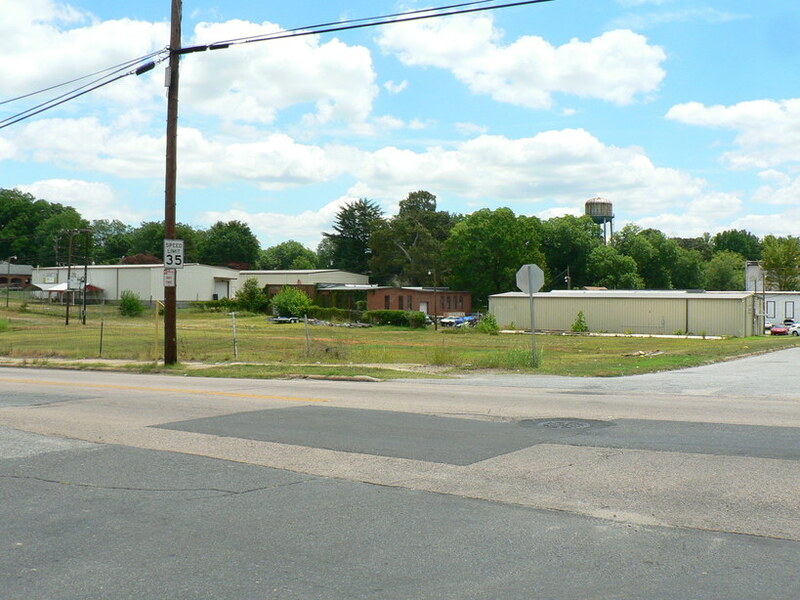 The last structure in this cluster is bounded by the railroad and intersection of East Cemetery Street. Built as a cotton warehouse circa 1900, another structure was later built that served as a feed mill (present day Ugly Duckling shop) as can be discerned in coloration of the brick construction. Boxcars were spotted at this ramp for decades lasting at least into the 1960s. The siding is still visible today. Records indicate all of these businesses were affiliated with the Overman Company during the 1920s era. Across East Kerr Street facing the north end of the passenger station is now a large paved lot providing parking or the station and businesses in proximity. The Southeastern Express---later Railway Express---building occupied this site and operated in conjunction with the passenger trains and station. This structure is visible in the 1965 photo above and was demolished circa 1980s. 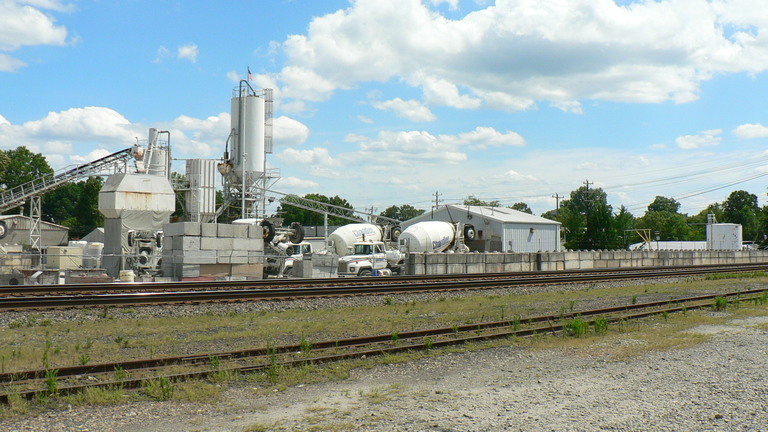 Chandler Concrete now occupies the site of the old coal and wood yard on the east side of the mainline. This area is directly across from present day Emporium. Track in foreground once continued to the Salisbury passenger station. Dan Robie 2015. On the opposite side of the mainline, the Chandler Concrete Company offers a prominent presence along the railroad and East Kerr Street. It is not a rail shipper today but the site it occupies is completely transformed from decades ago. 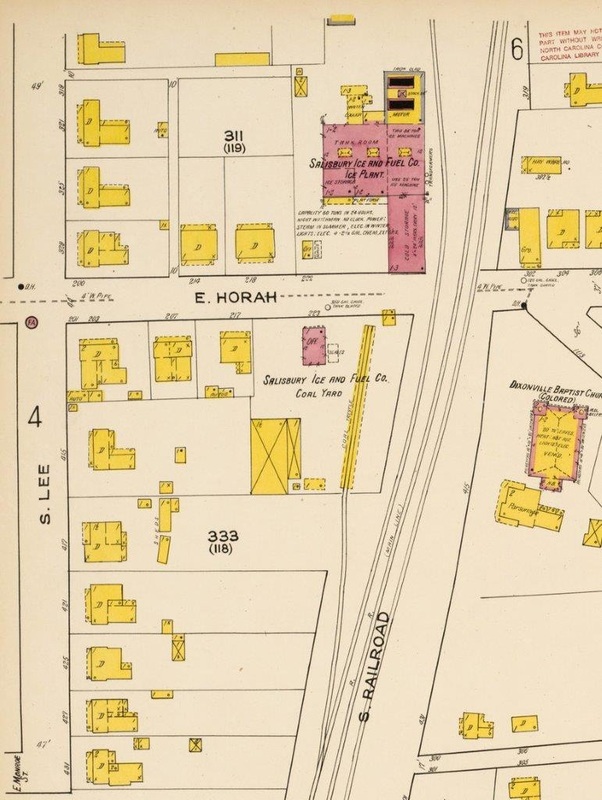 This area was contained houses fronting on East Kerr Street and directly behind, a yard for coal and wood stockpiles. A siding terminated here that saw boxcars and hoppers. 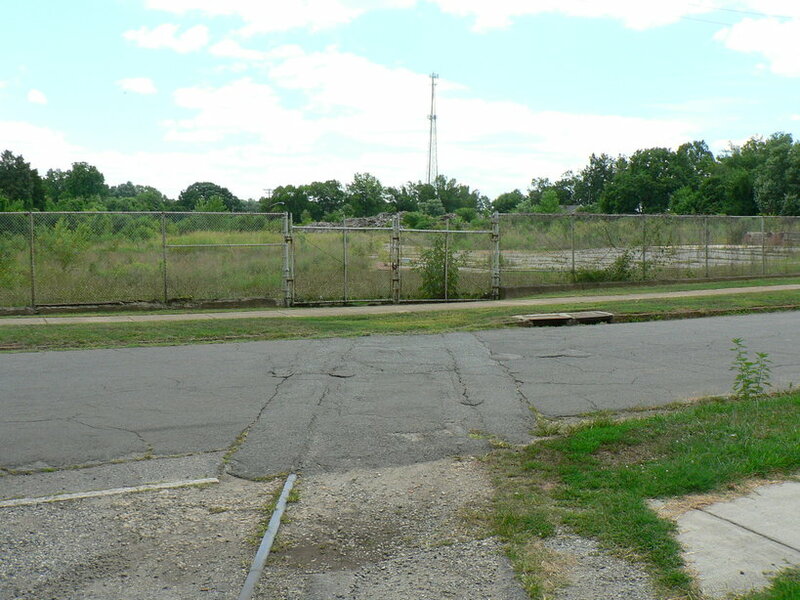 The area on the east side of the mainline opposite the north end of the station and bordering East Kerr Street was the site of the North Carolina Public Works. 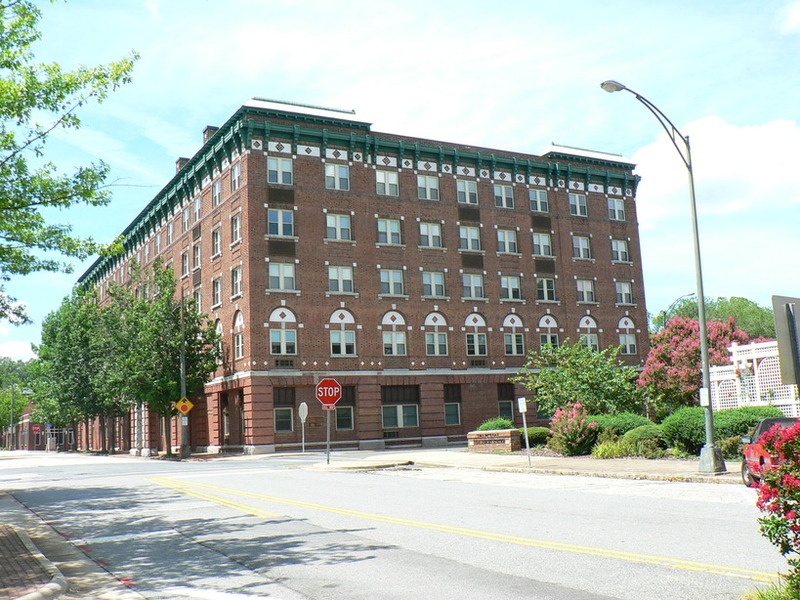 This was respectable sized complex that was an electric power generating station for a nine mile streetcar system that operated in Salisbury and Spencer from 1901 to 1938. It was served by a siding on a trestle and received hoppers loaded with coal. There is no remaining evidence of this power station as the property was redeveloped. Where the railroad and public interfaced at Salisbury. Primary in this sector is the Southern Railway passenger station and the hotels used in conjunction with rail travel. An interesting pair of sidings served shippers opposite the station area. The sector was----and to a degree still is---the railroad heart of Salisbury. Anchored by the Southern Railway passenger station, the East Council Street section was center stage with the public in the halcyon years of rail travel. Initially, the train station that first served Salisbury was of wood construction and relatively modest for a rail junction of its size. In 1908, a truly large scale station was constructed to serve the city in a period of expansion and industrial growth. The new building was grand in stature and curiously designed in Spanish Mission architecture befitting a Santa Fe Railway station in the Southwest. Its supporting structures enhanced the appearance with the impressive platform and canopies and ornate lighting at the exterior. The track serving the station was configured for trains from either direction and also for those destined to or terminating from the Asheville main. A view of the station from the Depot Street side circa 1920s. Note the streetcar track that existed on this side during that era. Image courtesy Rowan County Public Library. 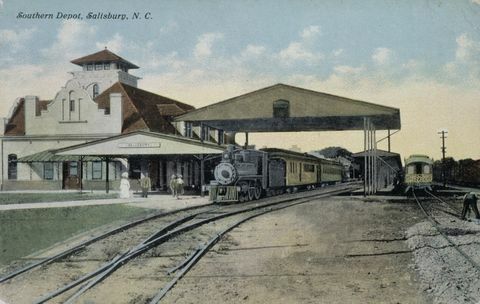 A postcard view of the south end of the Salisbury station as it appeared circa 1910. The complex was new and complete with platforms and sheds. Image courtesy Rowan County Public Library. A contemporary view of this station from the same angle as the postcard. Train shed and track are gone but the building remains the same. Dan Robie 2015. Today, over a century later, the building still stands with remarkable integrity still intact. Changes have occurred on the exterior with the removal of the train shed canopy and tracks adjacent to the building platform. Small offices occupy the north end of the structure including a terminal for present day Amtrak trains. The main concourse of the structure is now used for social events and large weddings which also includes the large concrete platform outside. In recent years, a new platform and canopy has been constructed adjacent to the mainline to serve the rail travelers of today. Landscaping highlighted with crepe myrtles and black iron fencing has preserved this historic building as a proud sentinel to the Salisbury of yesteryear. The area opposite the mainline from the passenger station was a pocket of rail shippers of differing commodities. These ranged from fertilizers, auto parts, soft drinks, and ice cream among others. Most notable in this group was the Carolina Beverage Company and the Chapin-Sachs Ice Cream Company. Two sidings served this group for which along the buildings were constructed platforms for unloading. Since there were only the two tracks, shuffling occurred where cars were pulled out in order that others could be spotted with incoming cars depending on the timing of the shipments. The sidings were not constructed at the same date, however. The one that served the Carolina Beverage was the oldest dating to the late 1800s. It was not until the World War I years that the second was added to serve Chapin-Sachs crossing the older siding on a diamond. This area was unique in its layout because the tight confines required the two sidings cross on a diamond in order to fit and run adjacent to the buildings. The most interesting building here in design was Chapin-Sachs constructed on an odd lot with curved architecture at the railroad side to accommodate the rail siding. It is a good example of late 1800s-early 1900s design common in urban areas constructed to fit tight spaces and to facilitate access by a rail spur. 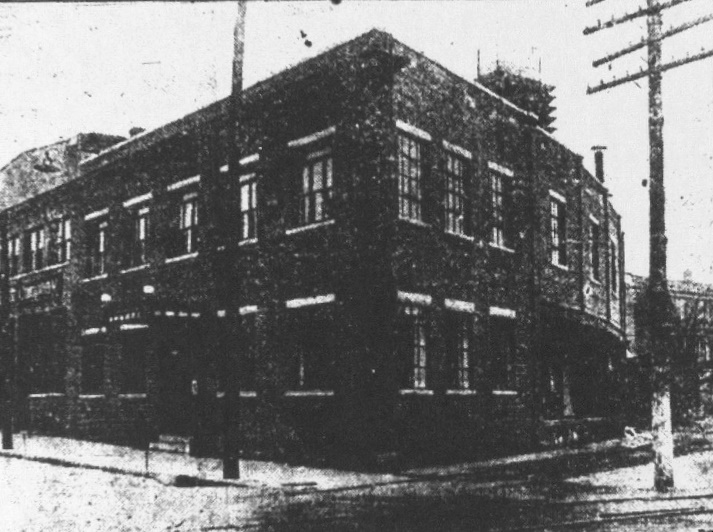 A section of the Chapin-Sachs building also housed a wholesale meat packing business. It, too, was also served by rail by means of a small platform that was adjacent to the curved siding. Yet another building and customers were served by this same siding at its end. Located at 316 East Council Street, this structure housed a contrasting pair of businesses---a wholesale grocery and a warehouse. 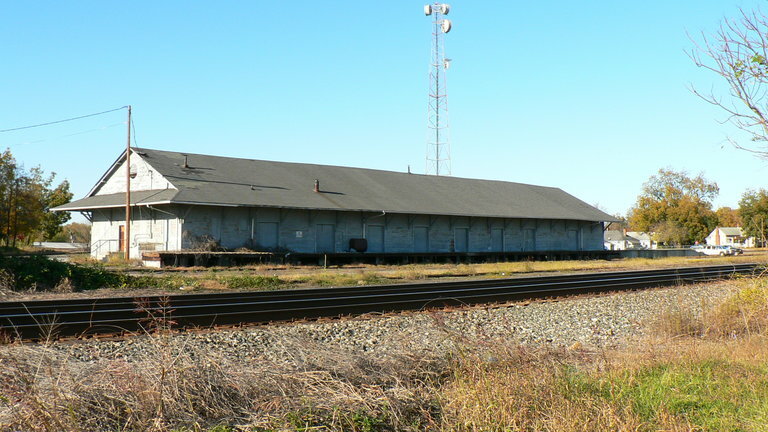 Although the Peerless Grain and Provision Company storage building---the primary wood building was demolished--does not appear to have been directly served by rail, it nevertheless was a part of the rail front in Salisbury. It was constructed circa 1910 and was among a gamut of feed and grain stores that populated the area when much of the local economy was still agrarian in makeup. 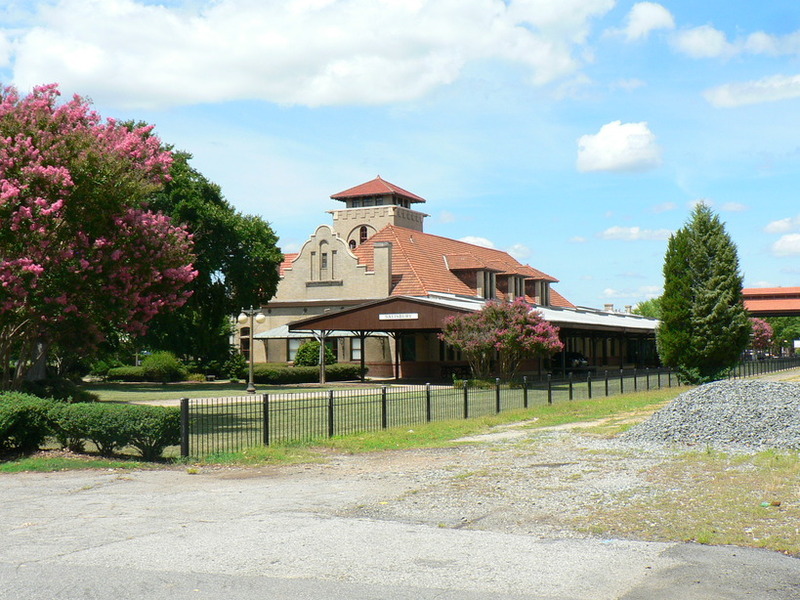 Situated directly across from the passenger station, it is among a cluster of several buildings that still reveal the face of old time Salisbury. The structure certainly reveals its age although still in reasonably fair condition. The old Peeler Grain and Provision storage building as it stands today. This structure is run down but still intact in a century of existence. Dan Robie 2015. 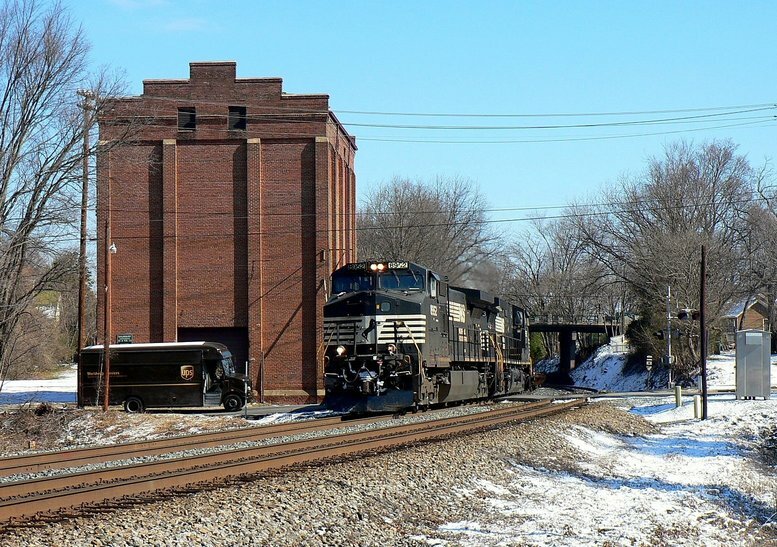 Located off of East Council Street opposite the Chapin-Sachs Ice Cream building and directly across the mainline is another structure that housed multiple shippers. Built circa 1907, it included in this building was a brokerage, a produce dealer, and a repair shop and all were served as needed by a large curved platform that followed the contour of the rail siding. 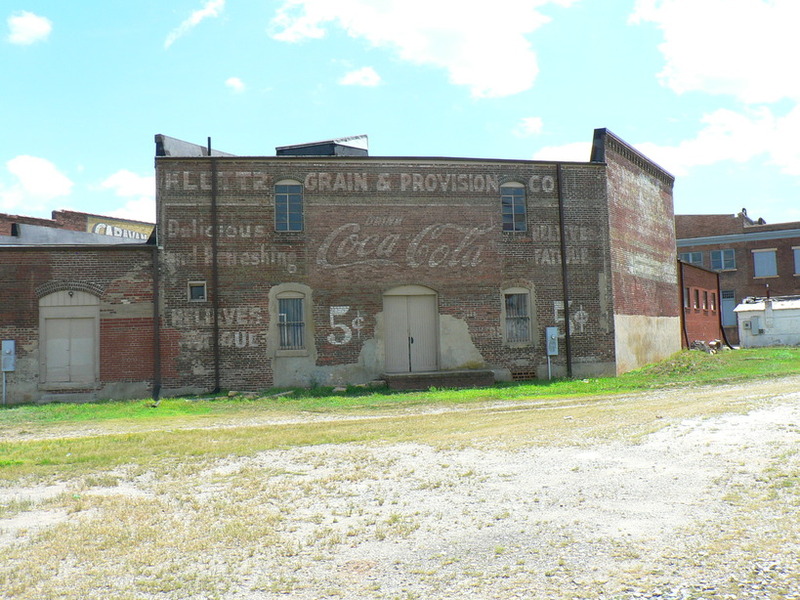 This structure appears to have received minor modifications throughout the years and today is easily identified with the faded Coca Cola advertisement on the railroad side. The platform is long gone as is the siding but glimpses of track are still visible along its path. 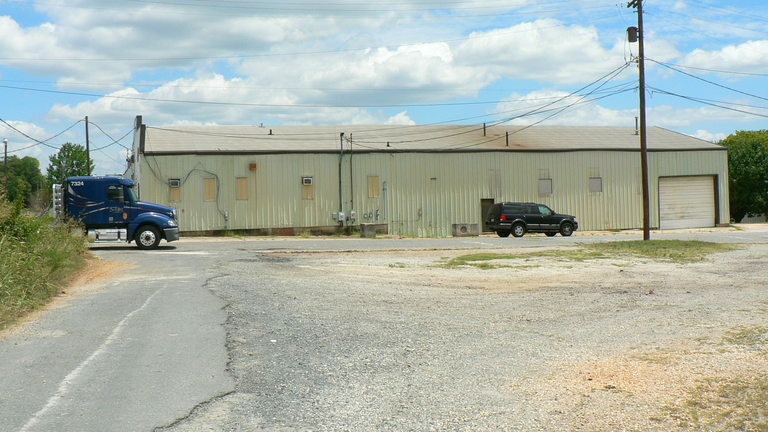 Beyond this building was located three other shippers that utilized this same rail siding. Swift and Company and two fertilizer storage buildings were near the stub end of the track. Today there is no trace of these buildings for they were demolished many years ago. The roadbed for the long abandoned siding. A curve platform once ran the length of the building here. Dan Robie 2015. Although the building has long been vacated from its original purpose, the address at 320 East Council Street created an enduring legacy. 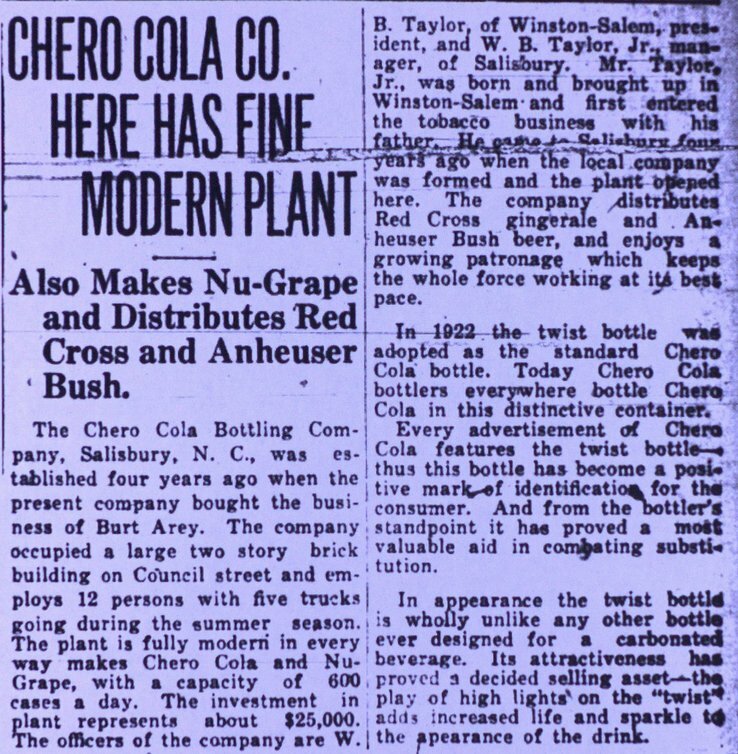 Founded in 1917, the business became the Carolina Beverage Company creating such concoctions as Mint-Cola and Chero-Cola. Gaining lasting fame would be the Cher-Cola which officially was renamed Cheerwine in 1926. This uniquely cherry flavored soft drink is entrenched in North Carolina culture and has expanded is distribution area in recent years. The company is still headquartered in Salisbury today. The construction of this building was the last of the rail shippers at the East Council Street-Salisbury station area which limited its rail access. Positioned on the same spur that served Peerless and others, the building gained access by a narrow platform constructed to the siding. This proved adequate but perhaps did limit the number of railcars at any given time period. 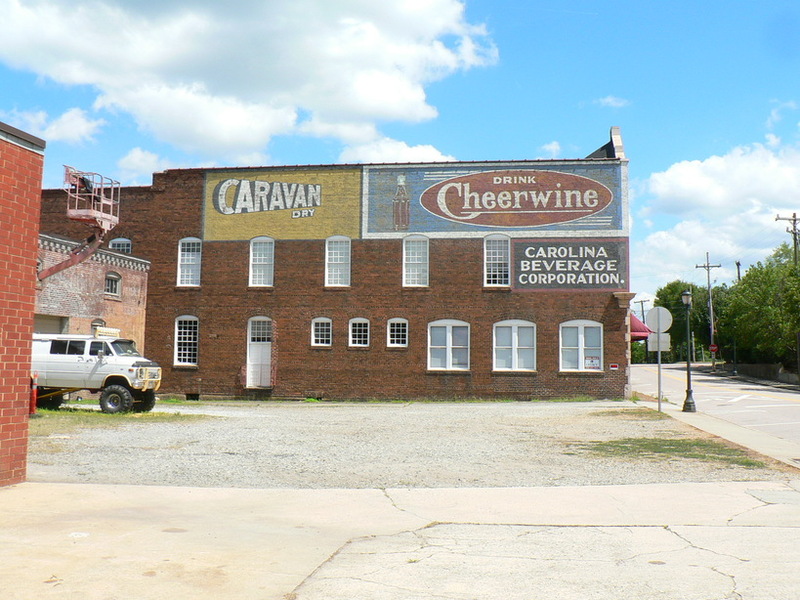 Many years later, the building still stands as the most prominent of the old industrial structures at East Council Street with the Cheerwine logo and Carolina Beverage Company painted on its brick wall. Moving south through the old residential area of town just to the east of the business district. The railroad passes through a deep cut in this sector and the defining feature is the overhead bridges spanning the tracks. At the north end of the map is the south end connection from the passenger station and at bottom, the siding extension from Salisbury Ice and Fuel. These are railroad locations and structures not identified on the previous 1965 aerial. Moving south from the station area and East Council Street, the railroad enters a long cut bordered by an old residential area on both sides. This sector is east of the commercial section of Salisbury and is listed as a historical district. Three bridges span the railroad here---East Innes, East Fisher, and East Bank Streets. All were originally narrow wooden bridges spanning the railroad but have been widened throughout the years. 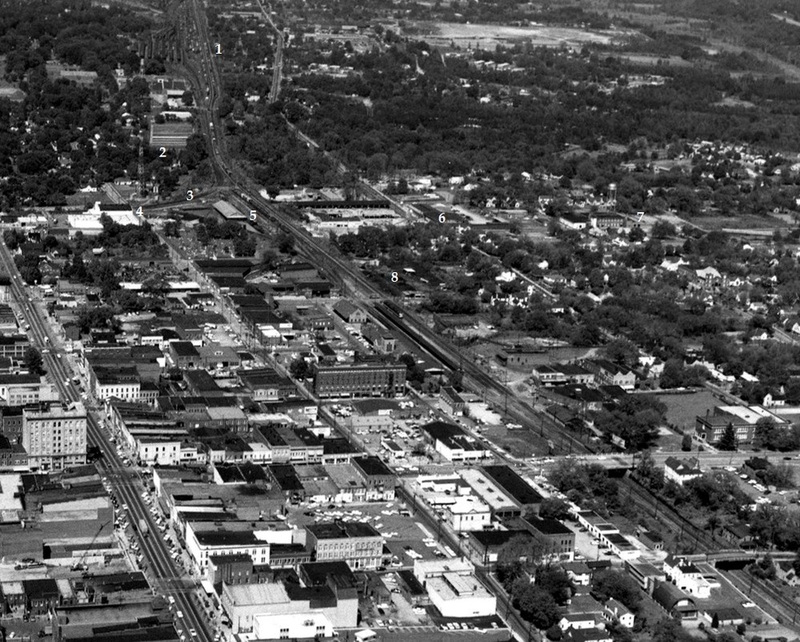 East Innes Street---as the primary east-west thoroughfare across town---was reconstructed and widened to four lanes. It and the other two bridges provide interesting overlooks of the railroad and a setting quite similar as it was a century ago. The railroad right of way through here is tight as what might be surmised passing through a cut. It is an interesting study of a residential section bordering the track with rocks, walls and steep sloping back yards descending to track level. For the modeler, a good study of employing these timeless elements on a layout. The railroad below the Bank Street overpass was the scene of a tragic collision on November 24, 1915. Northbound second section of Train #32 with three coaches and three Pullmans departed its last station stop at China Grove at 9:16 PM running 36 minutes late. Located south of the Salisbury station was a main line crossover, Train #32 was given a stop indication when it arrived at this point at 9:30 PM. Locomotive #1219 stopped 20 feet short of the crossover switch. After pausing for a southbound train to pass, Train #32 crept forward 20 feet and was stopped by a signal from the switch tender. ​At 9:38 PM, northbound Train #38, New Orleans to Washington, running on schedule, entered the curve south of Bank Street---where the Salisbury Ice and Fuel plant was located—and struck the rear of Train #32 stopped at the crossover. Train #38, consisting of locomotive #1333, a postal car, diner, club car and five Pullmans, was moving at 15MPH. The result of the collision caused locomotive #1333 to telescope a sleeping car for about 30 feet. The locomotive received minor damage but both trains remained upright on the track. This accident caused the death of two passengers and inflicted injuries on 35 additional passengers and 3 mail clerks. The ICC investigation determined that the cause of the accident was failure by the flagman of Train #32 to protect the rear of his train. Moving to the south end of downtown Salisbury bordering the region of South Lee and East Horah Streets. The Salisbury Ice and Fuel plant is the lone but prominent trackside structure here. 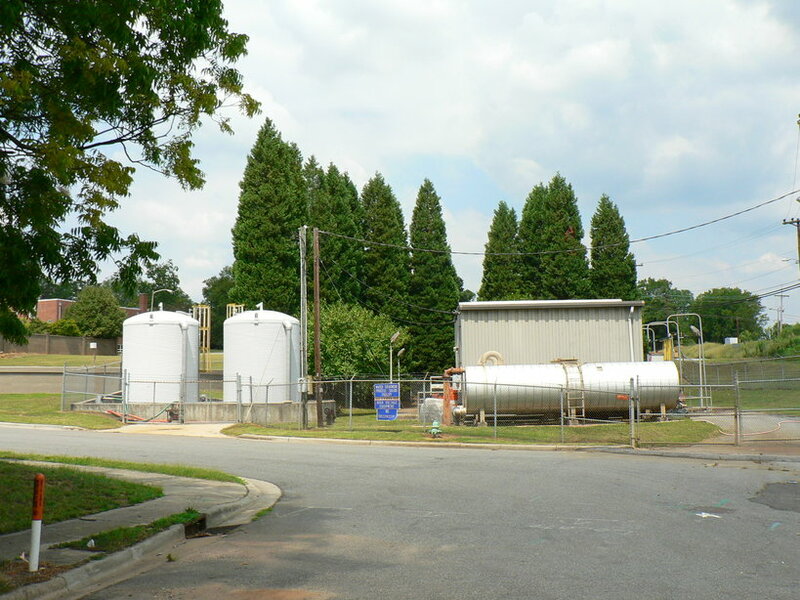 This sector of downtown Salisbury was highlighted by the presence of the Salisbury Ice and Fuel plant. 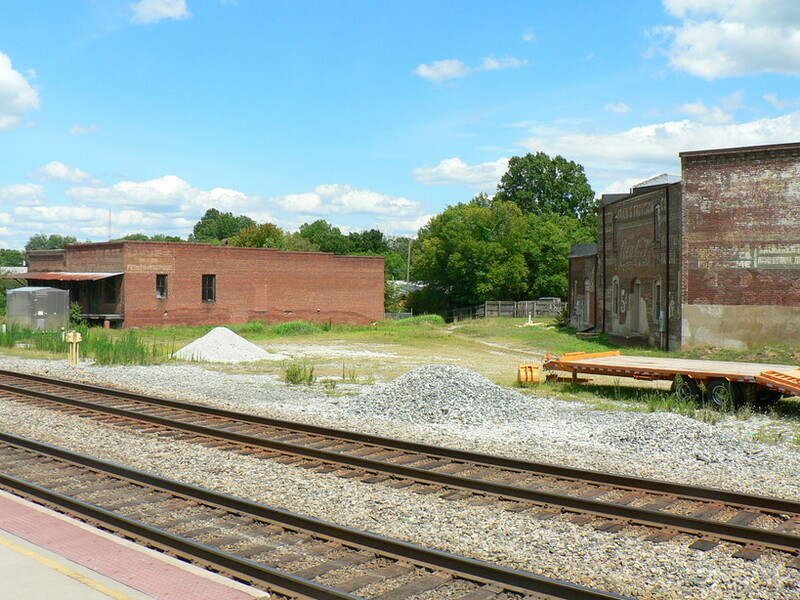 The building and its history are the topic of a separate WVNC Rails feature that also includes the icing operation at Spencer. Click here for the link to that page. 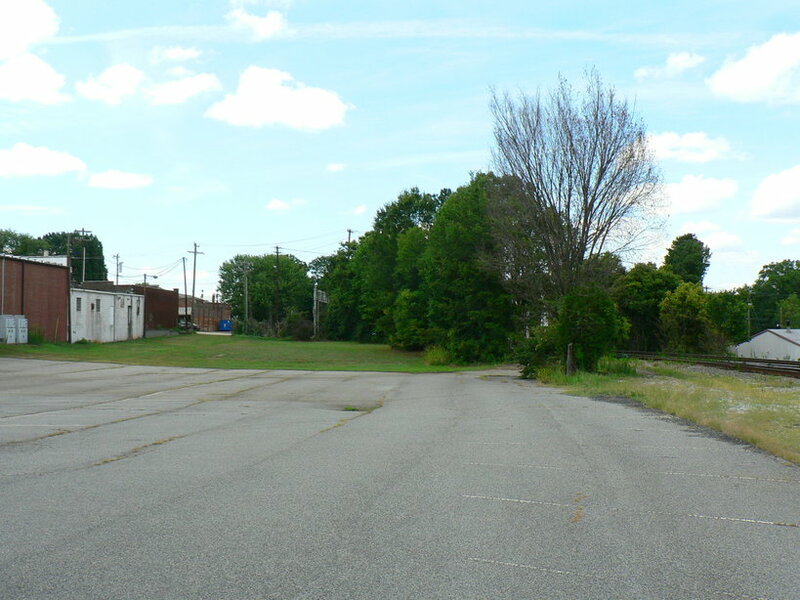 The south end of Salisbury adjacent to the National Cemetery and ending with the track layout at Yadkin Junction. No online shippers were located along the mainline in this sector. No on line shippers existed along this section of the mainline at the south end of Salisbury in 1922 and this has remained as such to this day. 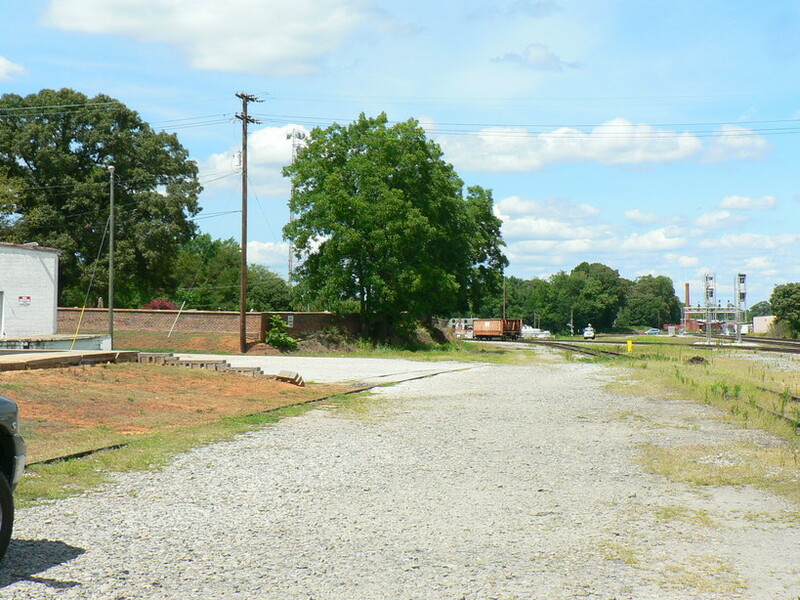 This area is accented by the track configuration that existed at Yadkin Junction. 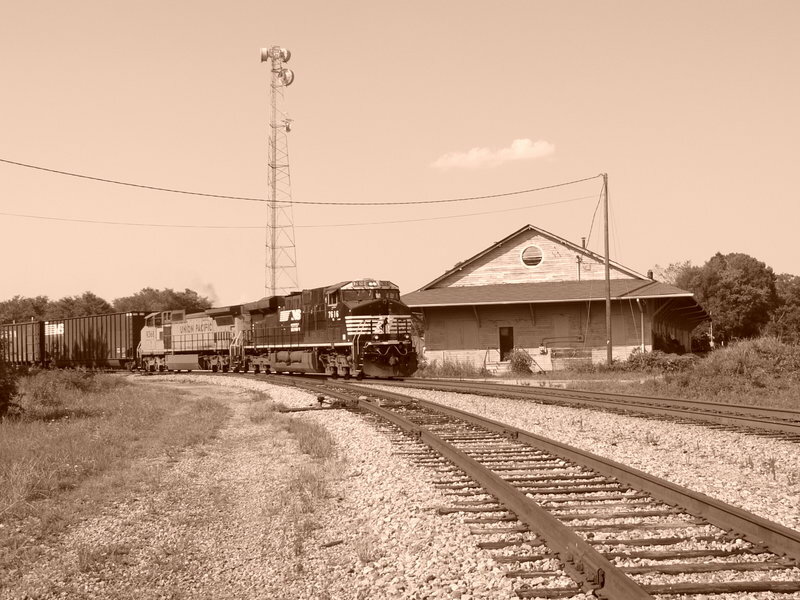 It was here that the Yadkin Railroad diverged from the Southern mainline on its trek to Badin, Albemarle, and at this date, Norwood. 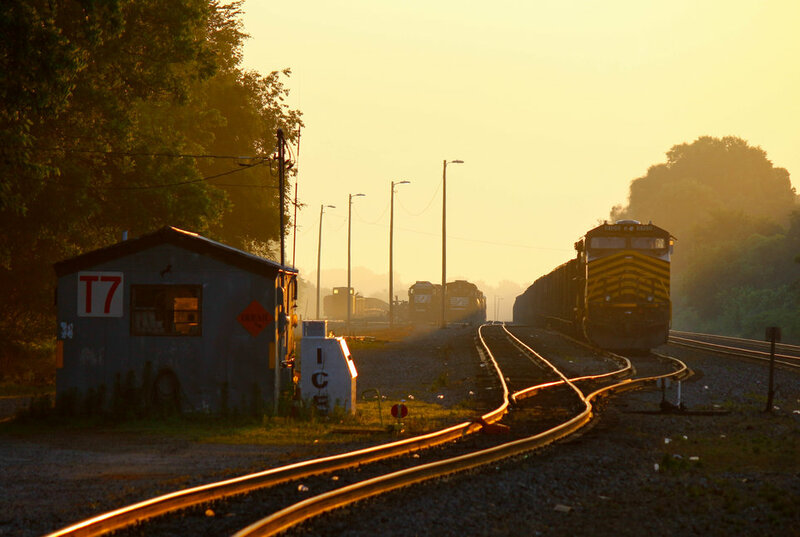 WVNC Rails contains a separate page about the Yadkin line and it can be accessed by clicking here. Local evangelist R.G. Pearson spoke to a gathering at the Salisbury Farmers Market in 1887 about the prospects of the future. He stated that “the great many poor and indigent people we have here ought to and must be helped not by gifts and aims but by a chance to make an honest living.” If only many present day politicians and business leaders practiced this motto rather than simply giving it lip service. As a result of that meeting in November 1887, a number of influential people gathered pledging their support for this goal. The solution was the construction of a cotton mill to employ many that were the subject of R.G Pearson’s words. Financial backing was arranged and by the following month, officers were elected to manage the newly formed Salisbury Cotton Mill. The venture proved successful and by the end of the century, the mill was among the largest in the state. Listed in its capacity to manufacture were 15,520 spindles and 503 looms. This mill was large by all measures. 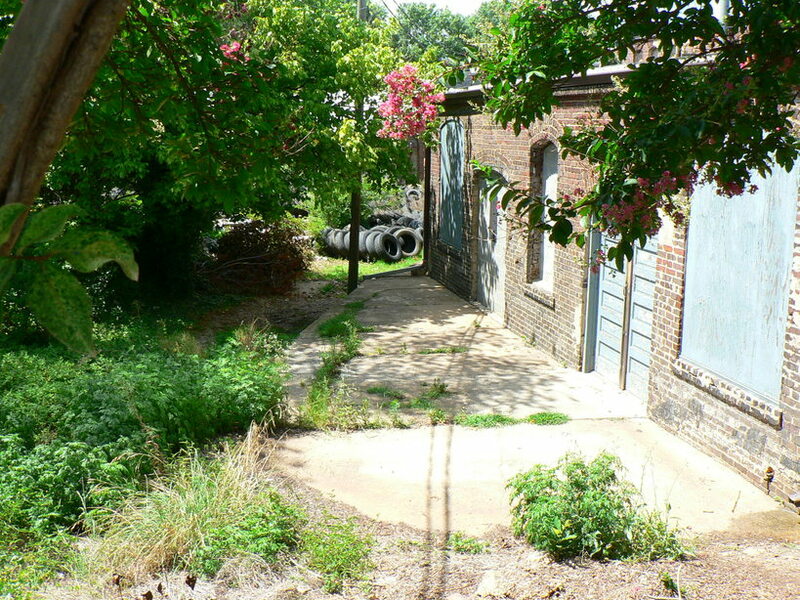 The property was located on South Railroad Street bordered by the military cemetery and the Southern Railway mainline. 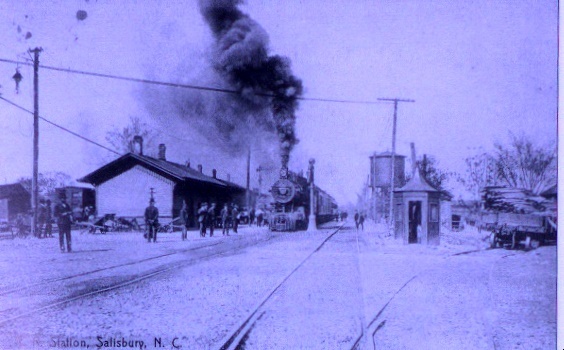 Adjacent was the connection to the Yadkin Railroad and the spur that served Salisbury Mill was actually connected to a runaround track at the junction. Cone Mills purchased the company in 1920 and operations continued under that name for the next 80 years. During the span of its lifetime, the mill produced materials such as chamois, flannel, denim, and chambray. As large and profitable as Cone Mills was, it simply could not compete with the influx of imports produced by cheap labor overseas. The 1990s sounded the death knell for most of the textile industry as the decade witnessed closings of long standing mills en masse. 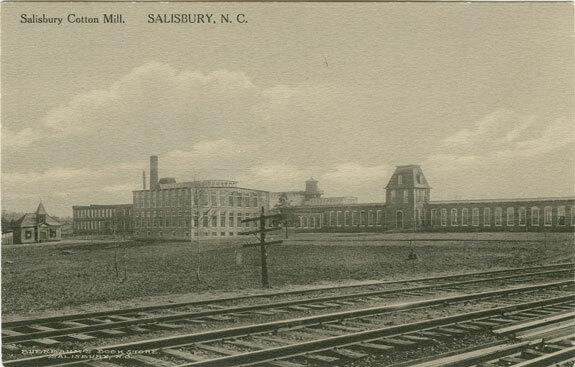 Cone Mills shut down its operation at Salisbury in 1999. 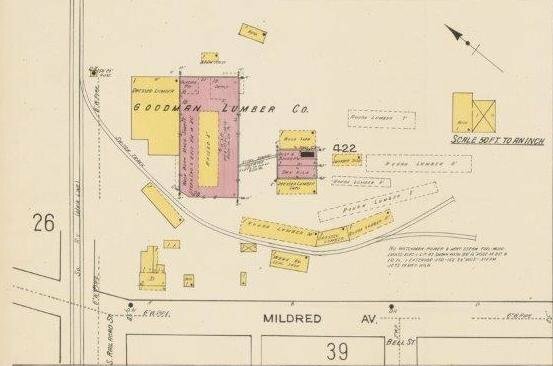 The Goodman Lumber Company layout beside Mildred Avenue as it appeared in 1922. Rail siding from the mainline served the yard but no trace of this remains today. Not shown on this map is that the property also borders the Yadkin Railroad. Most of the businesses listed on this page long ago passed into oblivion. They either closed due to obsolescence, were bought out by another firm, or simply relocated. One such business that has remained constant in Salisbury through a century of changes is the Goodman Lumber Company. Founded in 1907, it has remained a family run enterprise which in addition to a maintaining a solid business, accounts for the longevity. The company remains where it began expanding and keeping pace with consumer needs throughout the decades. 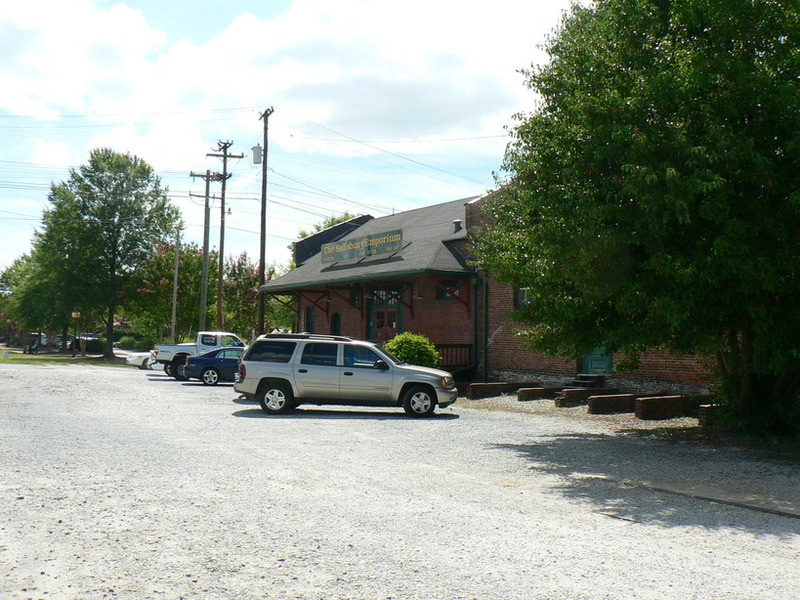 From the railroad perspective, the business was served from the mainline by a spur that crossed Railroad Street and faced the property on the Mildred Avenue side. It was here that the carloads of lumber would be unloaded for distribution or for the making of wood products. Today, barely a trace of this siding exists and the building has actually expanded covering the original siding right of way. 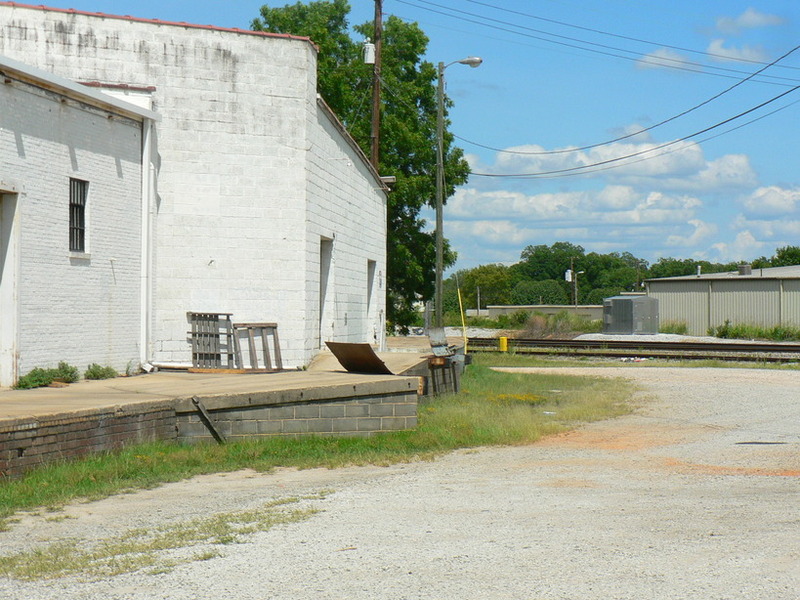 In later years, a siding was added on the Yadkin Railroad side to serve the lumber yards on that side of the property. Currently, the company is no longer served by rail. 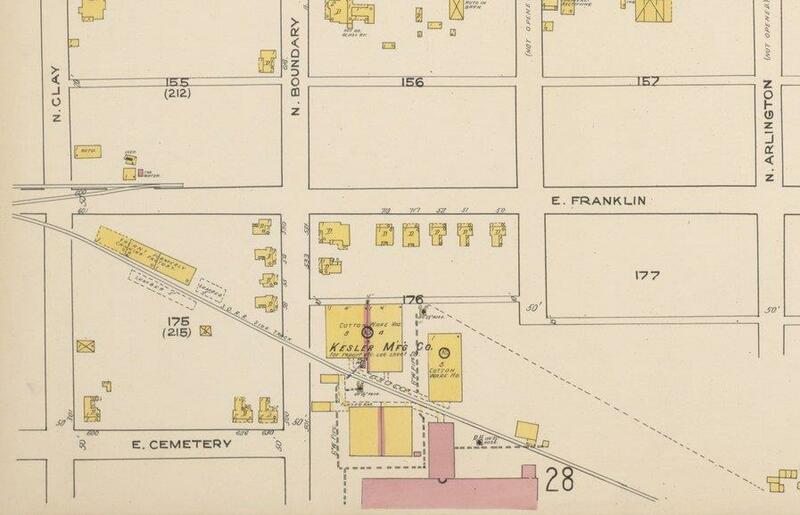 Of note is the absence of Lumber Street on the Sanborn map. It was either omitted or the street was added in subsequent years. At what was once the original southern boundary of the city limit existed a pocket of rail shippers. This region extends from the Mildred Avenue sector to what is now the present day Klumac Road area. 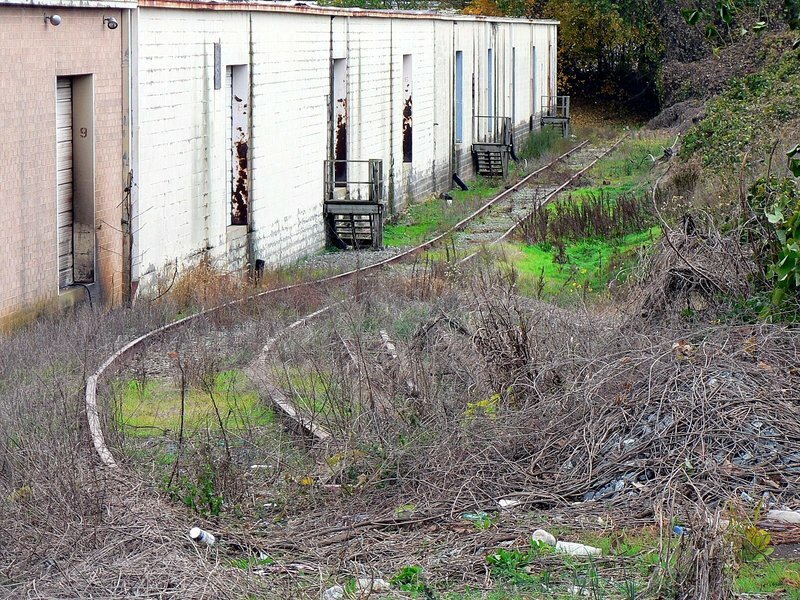 Various sidings were located here to serve the old Carolina Rubber plant, a concrete mixing facility, and the Food Lion warehouse. There is evidence of smaller businesses located here once served by rail that now lay in a dilapidated condition. Depending on the level of interest with this initial publishing, this piece may possibly be extended to areas exceeding the 1 to 1.5 mile parameter. 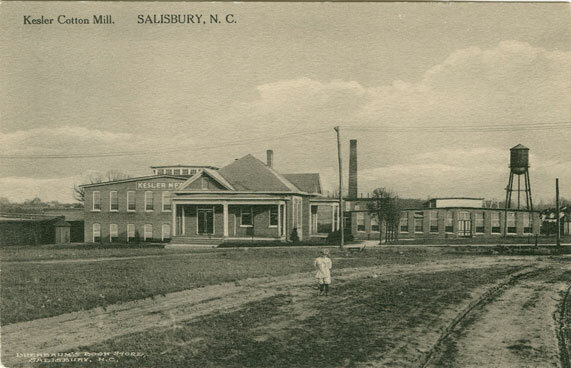 Beyond the 1920s, Salisbury expanded both to the south and west and there are regions along the railroad that developed during the World War II era and after. To the north Salisbury and Spencer is a conurbation; however, Spencer, quite unique in the railroad perspective, is deserving of an independent feature of its own. The area east of town is discussed on the “Yadkin Railroad-Southern Railway Albemarle Branch” page on WVNC Rails. As with all features on WVNC Rails, any additional information and images obtained will be added as updates as they may be received.